Reggie Regent is making an appearance Friday night for some great photo ops and you won't want to miss that. Misplaced the info?? Download it from this site. Over 100 of our classmates are already registered! Browse through the updates below to find out what our classmates have bee up to these last few years! The newest bios are at the top of this page. Who's Coming to our reunion? Check out the list of great Silent Auction Items. Join Jack Novick at the West High courts Saturday morning at 10 AM for some casual tennis. Everyone is invited to participate and come and watch (but it may be ugly). We are trying to get a few foursomes to golf Friday, August 12, starting around 9:30AM at Pleasantview Golf Course in Middleton. Cost is $38 for 18 holes with cart. Golfers can contact Dan Schuette to sign up/get paired up. Golfers so far are Dan Schuette, Rob Engelke, Richard Sinaiko. Help us find lost classmates! I have been retired for 5 years and happily remarried to Sandy for 21 years. My 90 year old mother lives in a condo in Middleton, and son, daughter and 4 grandkids all live in the greater Madison area. They keep me young (I think). We live in a condo in Sun Prairie. I graduated from UW-Madison with a degree in Economics and worked in sales/marketing/management positions in Chicago, Milwaukee, and Madison. I spent a year in Vietnam flying helicopters, a total of 3 years on active duty in the Army and another 23 years in the Reserves on a part-time basis. A few memories from Madison West that stick out are playing touch/flag football Saturday mornings in Shorewood, winning(and setting the record) in the low hurdle shuttle relay at the Janesville Relays along with Harry Kingsbury and Tom Klossner, hunting and fishing trips with Dave Slauson and others, and a month-long trip to Mexico the year after we graduated from West with Don Waisman, Bob Kurtenacker, Larry Ozanne, Denny (Zeke) White, Jack Novick and David Todd with Mr. Otto driving. Current activities include golfing, curling, and downhill skiing. I am active in my condo association, recently ran a charity golf outing for Badger Honor Flight, enjoy supporting the Badgers and Packers, and taking advantage of the many classes and seminars the UW has to offer including Grandparent University. Life has been good. 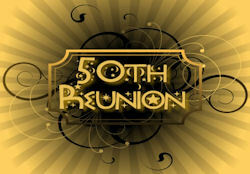 I’m looking forward to seeing many old friends at the 50th reunion. I married Ray eight years ago. We enjoy camping and are both active with the Boy Scouts of America. 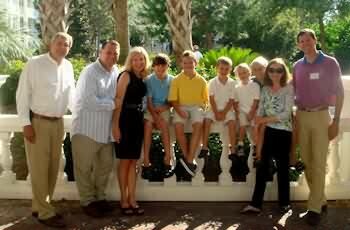 All of our children have grown and gone years ago and we have many grandchildren. I enjoy my work as Lab Tech an have no plans to retire. Hi West High Classmates Here I am down to the wire of reunion week and finally taking the time to share a few updates over the past several years. As a long time journalist I established a communications/media relations business about 12 years ago. My team and I primarily work with research universities, medical schools bioscience, and health care organizations in the fields of science and medicine. I translate science-based evidence ....new ideas, innovations, inventions, discoveries and trends into world-wide news. An example is last week's story done in conjunction with the Center for Disease Control about teen smoking. It received a lot of press in the U.S., but it was fun to see the words of a Washington colleague, "You're in Jerusalem" in the subject box of an email. We had to laugh at the photo the Jerusalem Post picked to accompany a story about teens......the person in the photo looks at least 40! Retirement is not in my near future...even with the pressure of ongoing deadlines I'm having too much fun to hang it up for now. I'm hoping to see you this week and had good intentions of attending the reunion, but fate intervened. As an aside, I see Donna McDowell (Beestman) and Jeff Bartell at our Downtown Madison Rotary Club, and see Karen Scheele (Hult) and her husband Burt at family events, but I was hoping to see classmates I haven't seen in years. However, I'm not sure I'll be able to join you. When I was in Croatia in June I injured my leg and continue to hobble around with a fractured kneecap and related issues. So if I make it to Friday nights' party, look for a purple cane and you'll find me. My 96 year old mother is having a bad patch, we are putting her in an assisted living facility, and so I will not be able to attend the reunion. Tell Bill Berge that I still get involved in bunch sprints with the 20-30 year olds on the weekend rides, and try to put as many miles on my Seven Cycles Odonata as I can. We don't have the hills that grace Wisconsin's landscape, we have overpasses and very hot windy days instead. Please convey my best wishes to everyone there, and I look forward to seeing everyone at the next reunion of the Class of 61. Am attaching a recent photo (I am the one with the pants). Micki and I have been married for 33 years. I graduated from medical school in 1976 and completed psychiatry training at University of Pittsburgh where I switched my allegiance from the Packers to the Steelers. Then onto Portland, OR to join the faculty at the School of Medicine (OHSU). Love Portland, particularly the summers. Still working at OHSU where I direct the forensic psychiatry (psychiatry and the law) training program and do various other things to stay solvent. The forensic work has involved some high-profile cases and concomitant travel including trips to testify at the international war crimes tribunal at the Hague and the marine Iraqi murder trials for alleged crimes committed by marines in Fallujah and Hamdania. This eventually resulted in a Fulbright Grant to Bosnia where my wife and i lived for 5 months last year. In our travels we got to see Lance Armstrong compete in the Tour de Suisse and to visit the Charles Sparr winery in Alsace (we know we're related). Our daughter is struggling (that's an understatement) through medical school at OHSU. Despite watching this unfold, our oldest son also wants to go to medical school preferably at Iowa where he currently resides. Our youngest son came to his senses and moved to San Diego where he has a post-graduate fellowship in applied math and computer technology. Won't be at the reunion but always have a small reunion every time I'm in Madison. 50 years has flown by. It really is about time for me to submit my first (and last?) bio. I earned BS and MS degrees in Nuclear Engineering from the University of Wisconsin. I worked several months towards a PhD, but eventually I decided to “Go West” as I had concluded that I had enough with the academic life and wanted to start a career and live somewhere near mountains. I took a job with the US Navy at a Shipyard in the San Francisco Bay area. My primary function was supervising the testing of submarine nuclear reactor plants which I did for most of my career The work was demanding at times with long hours and many days of continuous work, followed by periods of time with less activity. This enabled me to take a lot of compensatory and vacation time so I could pursue my hobbies of skiing, rock climbing (I started at Devils Lake), mountaineering (to over 22,000 feet elevation) in my younger years, and my passion since 1962, the collection and study of insects. In the early 1970’s I took a couple of trips per year to Central and South America to collect insects. During this time I met my wife to be as she was my travel agent. We married in 1976 and purchased a home and land on a mountain on the western side of the world famous Napa Valley wine area. Following the end of the Cold War and the resulting reduction in size of the US submarine fleet, our Shipyard was designated to be closed. 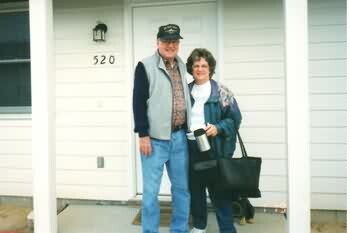 In 1994 I took an early retirement at the age of 50 as we did not want to leave the Napa area. Over the last 17 years I have been able to accomplish things I didn’t have time for when I was working including improving our properties, travelling, collecting insects and working on my insect collection. My interest in insects has taken me to most countries in North, Central, and South America, plus a few countries in the Caribbean and South Pacific. I still spend a few weeks each year travelling in mountain and desert areas of the western states to find insects in different habitats. I seldom go to the flatter areas east of the continental divide, so I probably will miss another reunion. There are 3 photos that I wanted to share. Marcy Harrington Burth and Ron, Kari Darbo Reed and Mike; Kevin Marretta with family wife Dee, Kyle and Kaitlyn visiting Nana from Naples, Florida...loved the snow; Lombardino's dinner with classmates making more memories. One more added with us at a church service in the local park. Since the last reunion when I was newly married to Mike our lives have been amazing. His 2 daughters have 4 children between them and we get to see them in Maryland where they live. I tell my grandkids that I have to take 2 airplanes to visit them in Florida and twice a year is about all I get to see them. Friends with grands close by are so very lucky - my dream! 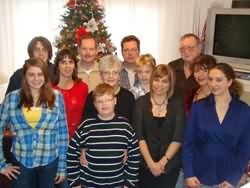 Photo of Florida family at Nana's for Christmas included. Son Keith continues to enlarge his real estate holdings and renovations in SW Virginia towards having a nice rental business. Even said he would build me a house in the lovely mountains overlooking the New River. Not much business down there but lots of peace and quiet. We are both realtors with a new Keller Williams office with Mike as the Principal Broker, teaches the classes and mentors new agents along with daily problem solving. I love helping folks find just the right home. My circle of friends gets bigger and bigger with each client I work with. Dad was a Realtor so it must be in my DNA. Mike was Headmaster of a Christian School in Fairfax and we took a British Literature tour to England with students. From the White Cliffs of Dover and the Canterbury Cathedral, walking tour of London while staying in a Hostel, Oxford with the 13 colleges and amazing history, all the way to Cornwall and Tintagel Castle where King Aurthur was said to be born. Also an Alaskan cruise before visiting friends in Vancouver and Seattle. 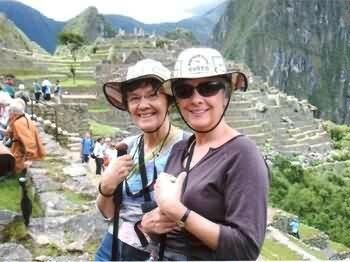 We aren't retired but love to travel. I continue to work at a law firm and am very involved with grassroots politics. My scare with cancer last Spring turned out to be an opportunity to realize how much I am loved by my creator. Tumor removed with no other cancer cells found. I'll bet we could all sit around at the reunion and tell tales of medical events at age 68! The new addition to the family is a precious rescued 5 yr old Shih Tzu. Oliver is a "companion" dog who loves to be where we are at all times. He brings so much joy to our lives. We will be driving to Madison for the reunion while taking time to stop along the way to see friends. Can't wait to see the old stomping grounds and renew friendships with classmates. I love retirement and being able to travel more, both near and far. I enjoy spending time with my son and grandchildren when they have time. Grandchildren: Jake - 15, Hannah - 13, Odin - 12, Thor - 5, Gabriella - 1 month. I have done some stuff and seen some things. Retirement is rough. It is tough to do nothing, you can never tell when you are done. I woke up this morning with nothing to do and I'll go to bed tonight and won't get half of it done. Hello to all. My teen years were pretty messed up due to the fact that both of my parents had passed away from cancer by the time I was 19. After a few years of menial jobs and numerous parties in Madison I pulled it together and talked my way into the UW where I wrangled a degree in Journalism. By the mid-seventies I found myself working for the Janesville Gazette, divorced, living in Edgerton raising four kids. Luckily they were good kids and my ex’s family were very supportive and they all turned out OK.
With a little financial aid from my weekend job at the dog track in Delavan they all made it through college. Steve (40) works in IT in Milwaukee, Mike (38) is a science teacher in Yuma, AZ, Annie (36) is a county nurse in Wabasha, MN and Krissy (33) is a nurse in Milwaukee. Annie is the mother of my three lovely grandkids, Abbey 12, Adam 9 and Sophie 7. I retired from the Gazette in ‘77 after 30 years of selling advertising there. Since then I have taken up slacking. I play golf five or six days a week in southern Wisconsin and northern Illinois with a bunch of old geezers from around here and the Chicago area. In the winter I spend a couple of months in Yuma doing maintenance on Mike's house and enjoying the sun. Phil Johnson tracked me down several years ago and we correspond regularly. When he was moving from Maui to LA. in 08 we met in Yuma for a few days of reminiscing. I'm a grandfather of two - we have a 2 1/2 year old granddaughter who got ADEM early this year; do any of you have any experience with that disease? I have worked for Life Skills for 9+ years now, helping people with disabilities (primarily developmental) get jobs. It is rewarding and challenging. I published a book in 2000 on an African American section of St. Louis that was torn down for urban renewal-a look at the close knit life in that neighborhood of segregated St. Louis and the totally inept (in my not so humble opinion) means that the powers dealt with the issues of that area-TEAR IT DOWN. My wife and I enjoy trips to visit our daughter and family in Portland, OR, a marvelous city and our annual weeklong vacations with our 18 year old grandson who is off to college now. I enjoy my Jewish studies and services (I joined their ranks 38 years ago). There have been a few changes since we last wrote ten years ago, not the least of which is that we have entered the realm of “Grandparenthood” and love it! Our older daughter Meli and her husband Michael live with their three daughters outside of Philadelphia in the little town of Berwyn. 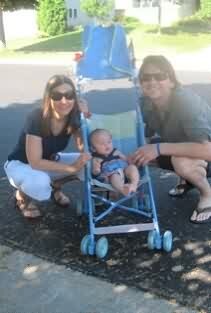 Our younger daughter Jacki and her husband Bobby live with their baby just less than an hour north of us. The train runs directly from Charlottesville to Philadelphia so Mary goes up to visit and help out several times a year, and she takes care of Alexis every Thursday. In addition to Grandmothering Mary still hikes with two friends every week in the Blue Ridge Mountains (15 min. west of us), plays golf with Jon whenever possible, enjoys the world of photography, and walks daily with our Westie Jerry. Jon has yet to find something he’d rather do than write and teach at the University of Virginia and so is resisting the thought of retirement. His work on the ancient Greeks takes us every summer to one corner or another of the Mediterranean for a few weeks – the picture is of us in Erice, Sicily last summer. After 45 years he took up golf again, trying to recapture the glories of the West High golf team! That, growing roses, Pilates, and keeping up with the children and grandchildren pretty much fill up his spare time. We have both lost our mothers now. Helen Villemonte died of ALS in 2002, and Evelyn Mikalson passed away in 2003. With all of our parents gone we try to see our extended family as often as we can, which usually means a reunion on the beach every summer at Pawley’s Island, South Carolina. It also means that we don’t get back to Madison very often, so we are very excited to come for the 50th Reunion and see old friends and visit places we remember so fondly. After high school, I attended UW, taking out a year to study in Israel. Finished my degree in Math and eventually got a Masters in Curriculum and Instruction from UW. 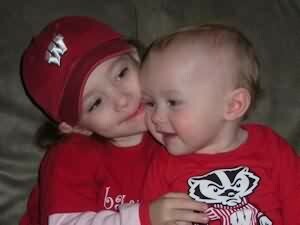 I was married in 1970 and had 2 great daughters, both of whom have given us grandchildren recently (see photo), I taught Math in the Madison Public Schools for 20 years and then moved to CUNA Mutual as their Director of IT Education. I stayed there until my divorce in 1994 after which I moved to Grand Rapids, Michgan to marry my current wife, Jeanne. We have 6 grandchildren so keeping up with them keeps us busy (gotta love Skype and facetime). 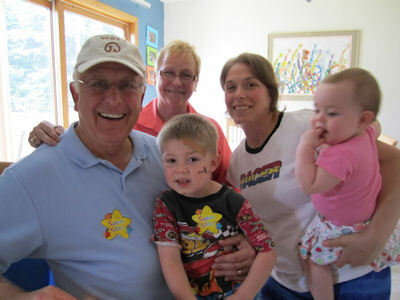 I am trying to get back to Madison more often to visit the grandchildren there and in Chicago. Maryalice and I live in Studio City, a part of Los Angles in a house we have been since 1973. We are both professors at USC, but I have just retired after 35 wonderful years as a professor of education, with an endowed chair, and being the associate dean for academic programs. Our daughter, Myranda, is the principal of a charter middle school that serves inner city youth, and our "adopted" second daughter (Meg) is also a charter school principal. 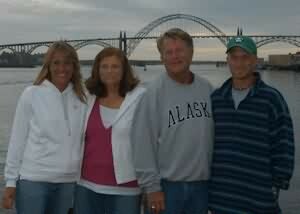 We frequently travel with Myranda and Meg--most recently a cruise to Alaska. We also have an "adopted" five year old granddaughter (Dot) whom we see quite frequently and who has an imagination to keep us charmed. When I retired two months ago, I gave a "last lecture" where I showed pictures of Madison West, and then described two events that turned that world upside down for me: a junior year in India that was both wonderful and the most demanding year of my life. 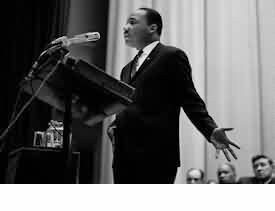 I came to have quite a different perspective on issues of diversity and poverty. The other event was the Dow riots on the Madison campus where the Madison cops beat many innocent students, and the 6 o'clock news that evening shifted the reality of that day to suit the senior administrators at the university. My professional focus has been research, policy and leadership development related to high schools. I've spent a lot of time in high schools in many other countries (especially Hong Kong, India, England, and Australia) and seen what American high schools could look like. I've also spent time in Turkey on several study tours looking at the relation of Islam and the west, and 63 countries so far. Retirement, for me, is a time of rebalancing my life to have more time for gardens, including my backyard that features a labyrinth, waterfall, wisteria, and a pond with water lilies. 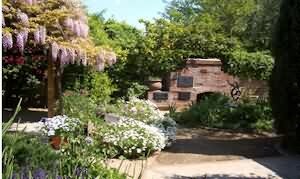 I also volunteer at a major garden (Descanso Gardens) near us. We are also quite involved in the Unitarian Church, and in several projects. One of these is highway 50 which runs across the US from Washington, DC to Sacramento--I am driving the whole highway in segments and preparing a book of photos and exploration of 6 themes about the highway. I am also working on a blog about how to drive on the English (left) side of the road. I look forward to seeing friends new and old at the 50th reunion. I retired at the end of 2008 after more than 39 years practicing with Shearman & Sterling LLP, a large international law firm headquartered in New York City. I had joined in 1969 with the expectation of spending a couple of years there and then moving on when I figured out what I really wanted to do when I grew up. Obviously, I never made it past square one. My wife Kathleen, to whom I have been happily married for nearly 38 years, and I have lived in New York City that entire time. We have three children: Nick (33), Jon (30) and Caitlin (26). They live in Jackson Hole, Los Angeles and San Francisco, respectively. All are involved in the restaurant/catering business, although Jon does it to support a struggling acting career and Nick does it to support a 100+ days a year skiing habit (in my next life I want to grow up to be one my children). Although farther away than we might like, they all live in pretty nice places to visit which we do as often as we can. No grandchildren yet. In fact, no daughters-in- law or son-in- law yet so some significant work remains to be done in that area. Since retiring, I have mostly devoted my time to the things that I did not have sufficient time to do while working, including reading, photography, learning Spanish, taking some courses at Fordham University, tennis and golf. I also am involved on the board of the homeowners association in connection with a small condo we own in Jackson Hole. 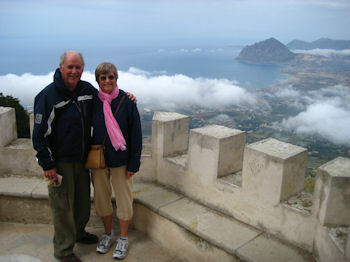 Kathleen and I both very much enjoy travelling which we have been able to increase since I retired. In addition to trips to visit our children, we have made trips to Honduras, Mexico, Ecuador and the Galapagos in the past couple of years. I have found no trouble remaining occupied. In fact, I sometimes wonder how I ever had time to work. Kathleen is also retired. She worked for TWA until Nick was born and then for a few years as development director of a children's theater company after the children were all past elementary school age. In the past few years she has become an avid bird watcher and now teaches a course for Audobon in a couple of underserved NYC public schools. She also sings in a couple of different choruses (with one of which she travelled to Cuba last year and Turkey, Georgia and Armenia this year). Needless to say, she is busier (and more productive) than I am. I am looking forward to seeing everyone at the reunion. From the halls of West High, to UW-Madison, marriage (48 years), football, teaching, business, travel, up-North cottage, good friends, many beloved pets, and best of all, two wonderful kids and their spouses, and our three beautiful grandbabies. We moved back to Madison six years ago, so the circle is closing..................but not for awhile. We're enjoying the 3 little ones too much! Children & grandchildren: See below. My husband John and I have lived in Evanston Illinois for 31 years, and both continue to work in our respective professions: John is a real estate developer and investor. After a 30 year career as a social worker in various social service agencies, , I am currently working as a psychotherapist at Cathedral Counseling Center ( essentially a large group private practice) in Chicago. Retirement is not on the screen for either of us, since we both find our work energizing and rewarding. Our daughters all live within a half hour of our home, and we delight in frequent family gatherings and many good times with our grandchildren: Madison,14, Eleanor, 12, and Reid, 8 ----- our daughter Jennifer's 3 children with her husband Doug Wilson; Henry, 6, and Lucie, 3, our daughter Megan's 2 children with her husband John Fleck's 2 children; and Charlie, age 1 week, our daughter Kirsten and her husband Scott Margolis' husband's son. We enjoy the rich cultural opportunities Chicago has to offer, and have no plans to leave this area. Life is good, in all respects, and we are grateful for that! Have been in Florida since 1969. Retired from window treatment and design in 2007. I am fighting a back issue at the moment or would have come up for the reunion. Hope to see you at the 55th. It hardly feels like 50 years. 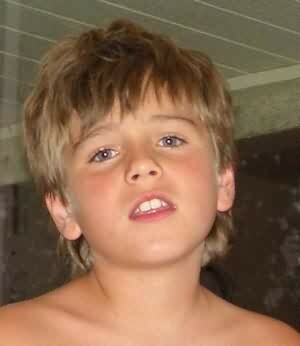 I feel the same and I think I look the same, although I wear a hat now to prevent sunburn. Paula and I have just moved and are building a home on Lake Superior just south of Bayfield. I retired from consulting in the plastic molding field 3 years ago. But, thanks to the influence of Paula, who’s an artist, I still do some Engineering in the art field. 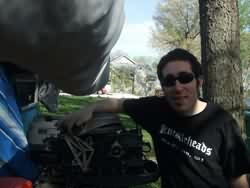 Several years ago I built a large etching press for Tandem Press in Madison. And I’m now helping the art department at Northland College in Ashland with their printing equipment. If any of you visit the atrium at Meriter Hosp you’ll see two glass waterfalls hanging from brackets that I designed. We’re especially proud of our daughters. Shelley is a nurse midwife at St. Anthony’s Hosp in Chicago and Lesley is an artist and teaches art in Wimbledon, GB. This is Lesley with Alex and Tatum in their rear garden in Wimbledon. This is Shelley, Dylan, Al, and Max in June. Our new home looks out on Chequamegon Bay. Here are some pictures of favorite activities. This one’s me, with the hat. This one’s Paula on the road from Bayfield to Madeline Island. I think she’s saying something about the ice thickness. Since Lesley lives in England, we’ve been able to visit Europe many times. Last summer included a side trip to Valencia. This is Paula at a museum complex designed by Santiago Calatrava. Paula and I are living in a one-room cabin this summer, watching our house go up. We’re really looking forward to seeing everyone in August. What’s new? Well, I finally retired from public health in March, 2011, in the midst of all the protests and angst in downtown Madison (I had a daily view from my office in the City-County Building). My public health colleagues gave me a wonderful send off. I will miss them all and miss the interesting and challenging work. But I’ve got other things to do; it was time. I’m still entangled with work/professional issues, on committees with the Wisconsin Public Health Association and the UW Nurses’ Alumni Organization Board. 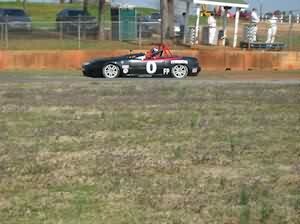 I’m still corner working races for Midwestern Council of Sports Car Clubs and Sports Car Club of America. I have included a photo from road race working, as inevitably people tend not to be able to distinguish that form of the sport from the other more boring forms (as in NASCAR….). The family picture (below) was taken on the Monona Terrace rooftop, during a visit from my New Yorkers (Ben, Janice and Maddy) during the week of July 11. We visited their favorite Madison spots (the Union, Babcock Hall for ice cream, Paisan’s for pizza, went miniature golfing at Vitense, played in various parks and went canoeing/pedalboating on Wingra, etc). I’m FINALLY getting around to dealing with about 30 years of deferred lawn maintenance. And that damn basement IS gonna get cleaned out. I swear. I’m on Facebook, but increasingly bored with that, so my page may not be up much longer. Hope to see you at the reunion. Since the last reunion when I was newly married to Mike our lives have been amazing. His 2 daughters have 4 children between them and we get to see them in Maryland where they live. I tell my grandkids that I have to take 2 airplanes to visit them in Florida and twice a year is about all I get to see them. Friends with grands close by are so very lucky - my dream! Photo of Florida family included. Son Keith continues to enlarge his real estate holdings and renovations in SW Virginia towards having a nice rental business. Even said he would build me a house in the lovely mountains overlooking the New River. Not much business down there but lots of peace and quiet. We are both realtors with a new Keller Williams office with Mike as the Principal Broker, teaches the classes and mentors new agents along with daily problem solving. I love helping folks find just the right home. My circle of friends gets bigger and bigger with each client I work with. Dad was a Realtor so it must be in my DNA. My scare with cancer last Spring turned out to be an opportunity to realize how much I am loved by my creator. Tumor removed with no other cancer cells found. I'll bet we could all sit around at the reunion and tell tales of medical events at age 68! Sorry I will not be able to attend. I am on the Board of Directors for the WI State Bowling Association and we have our business meeting that weekend. We will be interviewing the candidates for our new Manager at that time. I retired from American Girl in April of 2009. I was the Material Handling Supervisor and was with them for 13 years. I received my BA in Business Administration from Lakeland College in 1980 and worked for Ray-O-Vac (17 years), UW Credit Union, Madison Newspapers and a few others in Administrative Services. I was lucky enough to spend a year in Vietnam at the ammunition depot(Long Binh) that served the southern half of South Vietnam with my Army Reserve company. My wife, Charlene, and I have two children and three grandsons, all in the area, so we get to see them on a regular basis. 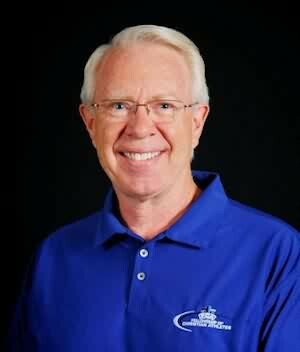 I have been active in the bowling community for many years, served as President of the Madison Bowling Assocaiation for three years and was selected to their Hall of Fame in 2004. 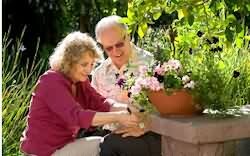 In retirement I am gardening and doing my best around the house here in Sun Prairie. As a west sider, it has taken me awhile to get used to being on the east side, but I am still a west sider at heart. I retired four years ago -- when the stock market was higher than it is now! I'm currently an Emeritus Professor of English at the U of Missouri-Columbia. We're in the Big Twelve -- or Smaller Eleven if you subtract Nebraska. I still attend professional meetings and publish articles from time to time -- though at a more leisurely pace. My specialty is English linguistics, especially as it applies to literature. My current project is an article called "Optimal English Verse," which analyzes poetic word order in Chaucer, Shakespeare, and Milton -- lines such as "When rocks impregnable [i.e., 'impregnable rocks'] were not so stout." If you're normal, you'll be surprised to learn how much pleasure I take in such things -- which make me feel as though I can eavesdrop on great minds. I have five grandchildren living in Columbia, which is great fun. Also, my wife, Svetlana Grobman, is a full-time librarian, so we plan to stay in Columbia for a while, although we sometimes fantasize about moving to Portland, Oregon (where I was born), or someplace similar. Madison would be great, too -- especially if global warming thaws out the winters. Svetlana and I married in 1997. She was born in Moscow, Russia. Her daughter lives in London with her husband and their two children, and Svetlana's parents and sister live in Tel Aviv, so we travel abroad a lot. We also ski in Colorado every year. Surprisingly enough, our downhill skiing continues to improve as we grow older. I wish we could say the same for our tennis! Our classmates from Madison West were as smart, interesting, and impressive as any group of people I've met -- so much so that I sometimes wish that we could form a retirement commune somewhere. Maybe we could hire one of our legal eagles (Mary Doyle? Willie Lewis? Jeff Bartel?) to incorporate us as an Institute, or a Think-Tank, or something like that. Paul Sorum could be our Institute Physician; Mike Fellman could be our historian, and so on. As for me, I could always proofread the brochure. I resigned from the "paid" workforce one day before September 11, 2001 (9-11). Steve and I have always been very involved in our grandkids' lives. They keep us busy attending their school functions, sporting events and extra curricular activities: cross country, track, baseball, basketball, soccer, dance and horseback riding lessons. 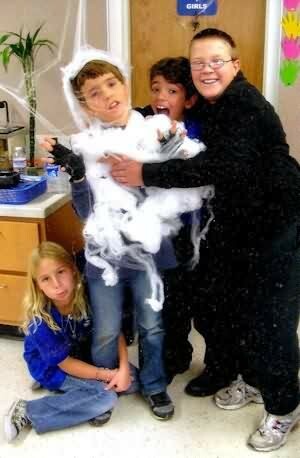 In addition, there are overnights, chauffeuring to/from school and just spending fun times together. We stay close to home except for driving to the traveling sporting events and taking an occasional vacation. Active, healthy and happy--that's where we are now! When I married my husband, Jack, September 11, 1965, after his graduation from the U.W., he made one promise; that our life would not be dull! It wasn’t. The first 10 years of his 27 years in the military were active duty and we traveled and lived in the South, the East, the West, and the Midwest before settling in Valencia, California 33 years ago. Jack retired from the U.S. Army as a Lt. 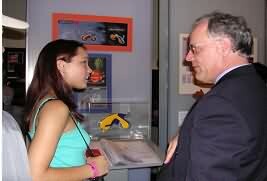 Colonel, and then from his position as a financial advisor with Lockheed Credit Union in 2003. 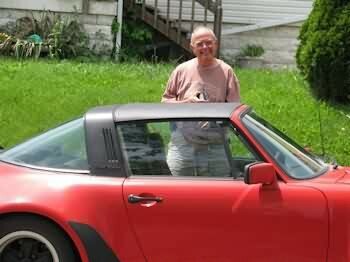 After Jack retired, we both enjoyed more time traveling with our Corvette Club, and almost a year later, Jack died unexpectedly in 2004. In 2007, I retired after 20 years with the Los Angeles Superior Court. Since then I have enjoyed travel with friends, my last trips being to Ireland, Venice and the Greek Islands. 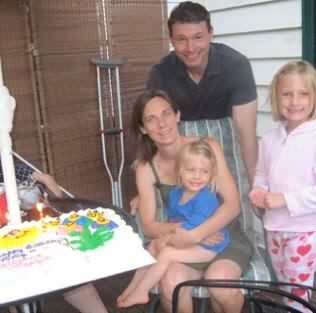 Daughter, Michele, 41, lives in W. Los Angeles with her husband, Peter, and two daughters, Katie, 6, and Lexie, 4. While Michele and Peter met as attorneys with a law firm in L.A., they both work in real estate investments with separate companies. 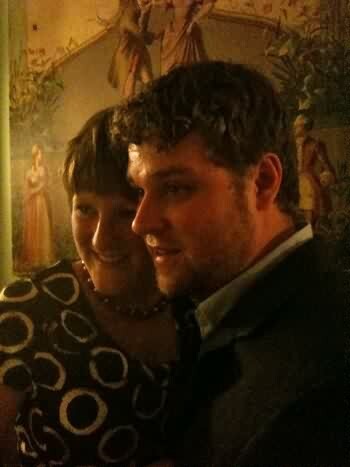 Grandma visits often to get her “sugar fix!” Son, Michael, 38, married Anne last September. 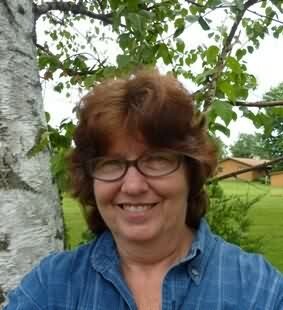 Anne is a scientist from St. Louis and graduated from college in Ripon, Wisc. Mike completed his Bachelors in Business from the U of Phoenix and he is the owner of a successful on-line pool supply business. They live in Valencia and we are all excited with their first baby due December 25th! My family, on the Finnish side, reunite every two years in Northern Minnesota at the family homestead, so I will be returning to the Midwest for that in August and I will not be able to attend the reunion. I do wish you all well and a fabulous time! 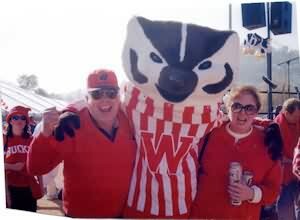 In the photos: my late husband and I at a party and one of us at a Badger/Bruins Rosebowl game a few years back. In the third photo is my son-in-law, Peter; daughter, Michele; daughter-in-law, Anne; son, Michael and me with my granddaughters, Katie and Lexie. Since ’61, I received BS and MS degrees from the UW and a Ph.D. in Government from the Claremont Graduate School (Claremont, CA). I married Mitzi Schneider in 1968, and we have two children, Scott and Dana. Mitzi has taught first grade for 25 years and now is retired and substituting in Park Ridge two to three days per week. I was on the faculty at UW-Stout for six years, four years at Ripon College, and retired from North Park University (located on the north west side of Chicago) after 30 years as Chairman of the Politics and Government and five years as Chairman of the Social Science Division. I have taught courses in Constitutional Law, Political Parties, Congress and the Presidency, and Political Philosophy. I retired in 2009 as I lost my voice due to nodules on the vocal cords. Late in ’09, I underwent a successful delicate vocal chord surgery at the UW Medical Center where they used gortex implants to move the vocal cords together. This was a small miracle for which we are most thankful. This allowed me to teach one course each semester this past year and to return to teaching two courses each semester in the 2011-2012 academic year. We get back to Wisconsin throughout the year to enjoy kayaking and canoeing and winter cross-country skiing at our second home just south of Fond du Lac. Unfortunately, our lives took an unexpected turn in June, 1996, when our son, Scott, then an honor student and a soccer player at St. Olaf College, was tragically killed by lightning while refereeing a soccer game in Park Ridge while home for his summer vacation. Coping with this tragedy has been painful, but we have survived the struggle by working to keep his memory alive. The birth of our granddaughter, Zola (now 19 months old), whom we take care of two days per week so that our daughter, Dana, may continue teaching art in Skokie, IL, has brought great joy to our lives and helped us deal with our tragedy. 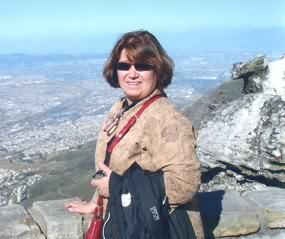 I retired from planning educational travel programs for the Association of Yale Alumni in 2008. 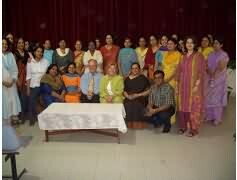 I enjoyed working with the interesting faculty and alumni and loved all the foreign travel I did as part of that job. Since then I have pursued my interest in archaeology-- auditing classes and seminars and participating in digs in interesting places-- York, England; Mongolia; the North Coast of Peru. I had worked for the AYA for over 16 years, after a career in museum work, which I began when the job prospects for a PhD in the History of Medieval Science didn't look too bright-- I wanted something more relevant and more practical. Since 1973 I have been married to Susanne Roberts, formerly the Librarian for European and Commonwealth History at the Yale Library. We have lived in New Haven since 1977 and have two children: Ethan, age 31, who was married this July to Amanda Espinosa, a lovely young woman from Wyoming (they met when he lived in Arizona). Serena, age 26, lives in Boston and works for the Boston Children's Hospital. For the last 20 years, I have been enjoying making home-brewed beer and, with Sue, hard cider. I’m a “National” judge for homebrew competitions. Other favorite activities include travel, cooking, letterpress printing, gardening and water sports (kayaking and for Sue swimming). Retired in June 2003, after spending 32 years in Brazil, South America working with New Tribes Mission. Currently helping out in N. T. M. assisted living facility nursing staff. My (is it 50?) years since high school have mostly been spent teaching (day job) and designing knitwear, a job I still hold. College, ending with a master's degree, the Peace Corps (Philippines), public school math and university math instructor in San Diego, Madison, Las Cruces New Mexico, and finally Houghton Michigan in the snow belt of Lake Superior. We've been here 31 years, most of which I spent as an instructor at Michigan Tech while my husband Chuck was a professor. 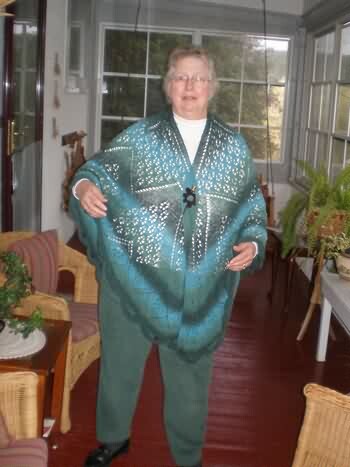 After one year of retirement, I taught a geometry for artists class at Finlandia University, which was a great way to combine math and my knitwear designing skills. I retired from teaching for good three years ago and have discovered the joy of traveling in the fall and other seasons. Going on cruises with groups of enthusiastic knitters is my current passion. I have been to the Eastern US and Canada, China, Japan, Russia and South Korea, as well as the Baltic, Norway, Australia and New Zealand. In October I will go on a trip to China which includes a Yangtze River cruise. The knitting continues, over 300 designs sold. I have one due to a yarn company on August 30, and there are always calls for proposals to respond to. Chuck and I will have been married 43 years shortly after this reunion. We have two adopted daughters. Emily is 28, finished a Peace Corps stint in Albania and got a double master's degree, and a job! in May. Elaine is 25 and is teaching for the second year in Japan. We have 3 wonderful cats, and have just been blessed with 2 grand cats. I am looking forward to seeing everyone. I am still working as an attorney at Foley and Lardner. Three of my children have moved back to Madison and we are looking forward to spending time with them. In my spare time, I stay involved with the Uiversity of WI=Madison and the University of WI Hospital and Clinics Authority. 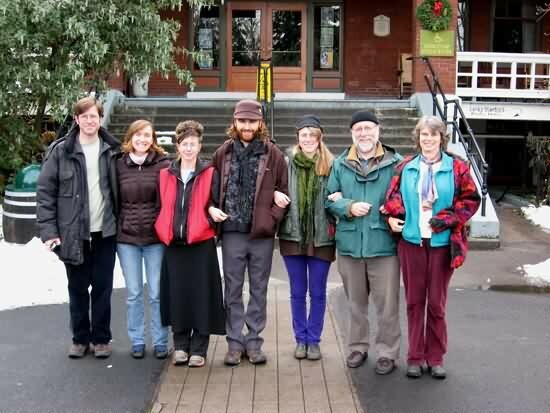 It's July, 2011 and I am in Montana with my wife, Julie, son David, 31, (degrees from Carleton College and University of Colorado) and son Brandon, 18 and about to enter Whitman College in Walla Walla Washington. We live in Middleton, but soon plan to spend more time at our 1930's log cabin on a lake in the mountains in Montana’s Seeley-Swan Valley. I am in the process of selling my company that I have owned and managed for the past 26 years. With luck, it could be sold by the time of our reunion. 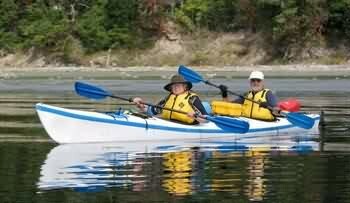 The main reason for the sale is that my retired friends seem to be having more fun than I am! It is interesting that many of my good friends, the ones I travel near and far to visit and the ones who visit us, are from our class of '61. Many will be at the reunion - Ansfield, Bunch, Millett, Rideout and Strenge. One is gone - Doug Green. Thank you to Ed Grob for handling this note four weeks before the reunion. I currently live in Madison, Wisconsin. 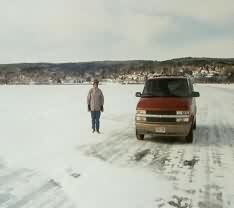 I have a lot on Lake Waubesa (Town of Dunn) that I am in the process of improving for building a house. I was married in 1975 and divorced in 2007. 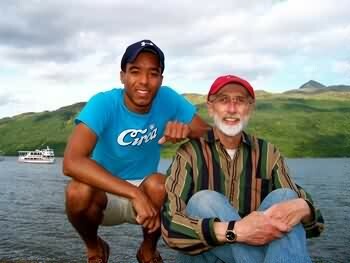 I have two sons, Gregory (27) and Michael (21). I have a BBA (Accounting and Personnel Management) from UW-Madison. I spent most of my professional career in accounting and financial management working for The University of Wisconsin System Administration. I retired in 2008 as the Controller of that institution.I am now self-employed as a financial manager and investor. I recently rediscovered and professed my faith and life to our Lord and Savior Jesus Christ. I was baptized this year at Devils Lake (called Spirit Lake by the indigenous natives). I would enjoy talking or meeting with any of you. Like the rest of you I feel I'm much too young to be attending my 50th class reunion, but time does march on. I've been single since my divorce in 1992, and have been enjoying many activities with other single friends I've met thru the years. In March of 2010 I met my prince charming and John Renz and I became engaged on Christmas day. John and I enjoy dancing, biking, card playing and traveling. This spring we celebrated our engagement with a cruise down the Rhine River. It was a trip of a lifetime for both of us. I have three wonderful children, Shelley-47, Chris - 45 and Terry-42. They are all successful and are busy raising my grandchildren. I have 5 grandchildren. Jesse 22, a student at MATC. Carly 15 and Megan 15 will be sophomores at Waunakee High School. TJ- 13 an 8th grader at Waunakee Middle School and Garet 12, in 7th Grade at Waunakee Middle School. They keep me busy during the school year with Volleyball, Hockey, band and orchestra. I consider myself almost retired, since Capitol Indemnity, the insurance company I worked for downsized in 2006 I was forced into an early retirement. Since that time I've been enjoying a part time job at Metcalfe's Sentry as a personal shopper. I'm looking forward to reconnection with all of you in August. 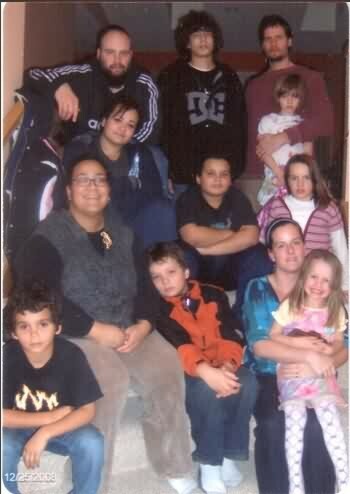 Bottom Row: Left: With Garet Right: The whole gang, Christmas 2010. After High School there was the odyssey to earn the Bachelors in Psychology and the Masters in Counseling Psychology at UW-Madison. While in college I worked in construction. I have worked in personnel at the UW, was a police officer, started the Dane County First Offender Program, was a financial crimes investigator for a group of banks and started Acrylicraft. Acrylicraft makes custom plastic products such as laboratory equipment, prototypes and display products. Avocationally I am an officer on the Shorewood Hills Fire Department and been a member of the Department since the early ‘60s and the EMS since the mid- ‘70s. Lately I have been working on prairie restoration with the Dane County Parks. 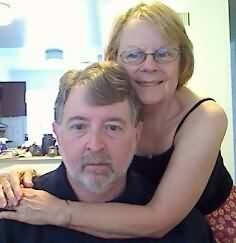 I have for the past nineteen years have been with my favorite person, Pat Tuckwell. We have been remodeling our house and traveling in our motorhome, for as much as we can find time. We are feeling very fortunate to be able to enjoy snowless winters in Yuma and summers in Madison, and the motorhome. 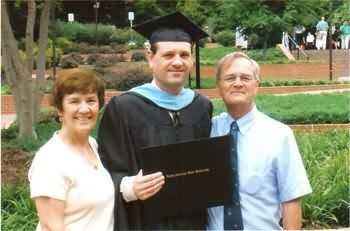 We appreciate how hard son David has worked to become a Certified Financial Planner. He and his family are living and playing in Madison. Wow 50 years!!! Never knew any actors from the Mikado or Oklahoma would make that!! And it’s good to hear news about other classmates from Randall School. Peggy Moore (West class of 1963) and I have turned over 46 years together and still are going strong. We have slimmed down our ranching activities in Ellensburg, Washington and spend as much time as possible aboard ALERT our 44’ sailboat-sometimes berthed in Seattle. 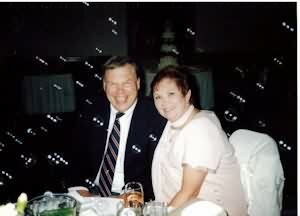 After I graduated from the University of Vermont in 1965, Peggy and I married and I worked for three years in Montreal where Peggy graduated from McGill University. Then we moved to Washington state where I attended the University of Washington and received an MBA. Our son Derek was born in 1970. I worked in consulting for a major CPA firm in Seattle and then in small business and consulting in Seattle. In 1990 we sold the business and I retired at 50 –yea sure! –to our ranch in Ellensburg. Derek and his wife Kerry have provided us with two wonderful grandkids. Skiing, bicycling, tennis and other sports have all been part of life. During all these years I raced and cruised several sailboats in the Pacific Northwest, across the Pacific and South Pacific and in New England and Europe. A couple of years back we sailed down the west coast to Mexico and the Sea of Cortez for a year but are now back in the northwest. This summer we will be in B.C. 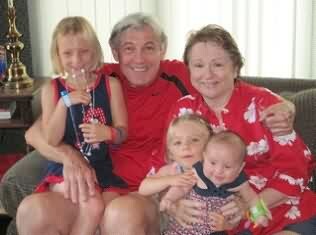 waters , with the grandkids aboard, during the reunion but will send a toast your way. We haven’t been to Madison for a while but wish all of you the very best at the reunion. My wife Sandy and I are both retired and have been married 42 years. 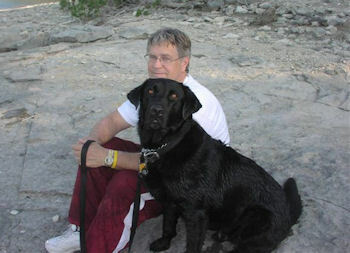 I retired Jul 3, 2006 from Packaging Technologies, Davenport, IA, after 40 years as a Design Engineer. I have resided in the Quad-Cities (Bettendorf, IA) since I left Madison, but still love to follow the Madison Scouts Drum and Bugle Corps, which both my youngest son and I marched with. We try to visit Madison at least once a year. I still enjoy woodworking and keeping active in our community. We have enjoyed spending time with our family and friends, and have been able to do a small amount of travel, but are looking forward to doing a lot more. While you are all celebrating 50 wonderful years we will be in Toronto, Canada visiting our eldest son, and traveling throughout the NE. In the last 50 years I have gone from being an Occupational Therapist to a potter. For over four decades I have been covered with clay making a large variety of functional pots. Have lived in rural Spring Green between dairy farms, working in an old former cheese factory creating pots. I now have my home and studio for sale and am so looking forward to moving back to Madison and starting the next phase of life: Retirement and the time and hopefully energy to do some volunteer work in several areas. Before our 40th Reunion I noticed a "lost list" for our class. Over 170 names were on that list. I decided that I would try and find those classmates that we had lost track of over the years. Felt that those of you listed as "lost" might not want to come to a reunion but that at least you should be invited and tied into any present class activities. As of today I think there are less than 30 names on that list! I have had the rare privilege of talking to so many of you -- and hearing your stories about high school and life after. Ten years ago Robin Allin was one of the folks on the "lost" list. I got his number for his sister-in-law but she made me promise that if she gave me the number that I would call Robin. In talking, we decided that we should do something to celebrate the great education that we had recieved at West and honor our classmates who had passed away. Eventually with the help of Jeff Bartell we set up the Madison West High School Class of '61 Educational Foundation. Over the years Our Class and their generous donations have helped students by providing training in leadership, diversity and communication skills. In recent years we have helped fund larger programs at West (involving up to 100 kids each time) in dealing with diversity issues and helping them find their own voices to be able to express their thoughts on various issues. It is interesting to see how the texture and flavor of West has changed over 50 years but the excellence in education appears to remain a constant. I bought a condo in Middleton a few years ago. It looks west onto the Pheasant Branch Nature Conservacy. I am really looking forward to moving back to "the city" and having easy access to friends, movies and shopping! I will miss my country living and beautiful valley but as I said I'm ready to embrace that next exciting phase of our lives. Hope to see each and everyone of you at our 50th Reunion. Even Reggie Regent ~ 501 in a Class of 500 ~ is going to be there Friday night! Here's to the Maize and Blue. Retirement is great! 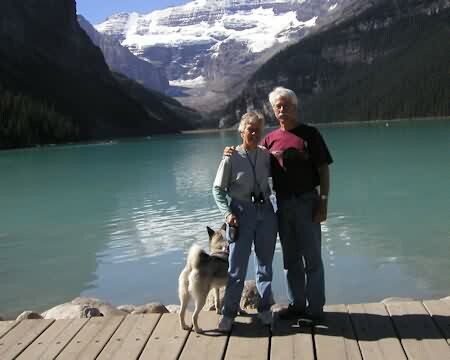 Peggy and I enjoy attending choral and symphonic concerts, traveling, cruising (9), hiking, dining out, quiet time at our lake house, and visiting our children and grandchildren. Still in NC Went to the 2011 Rose Bowl - saw Helaine Suckle Kotler and Dr. Robert. June '11 - Q family reunion included Sue Wehrle Q and Ronnie Q. In the last 5 years, we've finally gotten a son married. We are now the proud grandparents of two-year-old and 7-month old grandsons. What a joy we thought we never would have! What a joy!! No retirement in my plans...still in the grocery products business. I now work as an independent contractor, on retainer as a sales manager of various market areas and retail segments for a beverage company; cleaning product; dry tea line; pasta and hot sauce brand. I am also on the board of a new "brain boosting" beverage (drink it every day!) helping them get off the ground. 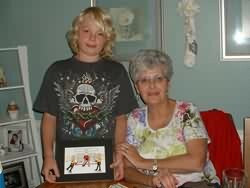 My son, Robin III, is involved with my brands through his demo/retail merchandising business and Sheila is the CFO! All of us live in the Chicago area with Christopher nearing completion of Chiropractic Medical Degree and Derek doing the hard work of a welder (with good benefits!). This year marks 40 years that Judy and I have been living in Connecticut. I continue to work in my private practice in speech-language pathology. Both of our sons and grandchildren live in California. Ed, thanks for doing this job for us. Last year, at age 67, I retired from the practice of corporate law with the firm, Quarles & Brady, a Milwaukee-based national law firm for which I opened the Madison office in 1983 and served as managing partner. During that time, the office grew from one lawyer to 45. Meanwhile, my wife of 43 years, Angela, retired after 30 years as Dane County Circuit Judge. She has started a mediation and arbitration business that keeps her as busy as she wants to be. We sold our house on Plymouth Circle near Hoyt Park (where I lived with my parents when I was in high school) to our eldest daughter Jessica and husband Bill (both physicians) and moved to a house out in Middleton Hills. So, they and their 4 girls are the 3rd and 4th generations of Bartells to live there. We spend much of the winter in Tucson, AZ where we own a small home near Ventana Canyon. We have 9 grandchildren whom we love dearly. Fortunately, most of them are in, or within 2 hours of, Madison. 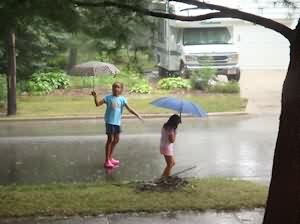 We are often called on to provide baby-sitting services. In retirement, I am spending my time serving on several boards, including Monona Terrace Community and Convention Center (where our Saturday night reunion party will be held) and the Board of Regents of the University of Wisconsin. We also ride motorcycles, play golf, hike the mountains around Tucson, take a few classes at the University, and regularly attend classical and jazz concerts, theater and dance performances in both Tucson and Madison. Recent vacation trips include Tanzania (Kilimanjaro and Serenghetti), Turkey, Equador and the Galapagos, and last January, the Rose Bowl in Pasadena -- the Badgers lost to TCU. Nobody told me retirement would be so much fun! 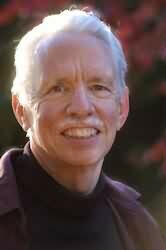 Glen, raised 3 daughters and worked for the Lodi School District for 26 years. I retired in 2005 and now enjoying family and traveling. Enjoying retirement and travelling a lot. Right now plan to stay put because we enjoy all that the Washington, D. C. area has to offer. I retired from the Dane COunty Library Service in 2009 after 45 years and love being retired. My husband Ben will be closing his travel agency in July after 45 years and our last big trip was to Brazil and the Amazon River in March of this year. Our son Heath is married and lives in Santa Rosa, CA and just had a new baby boy on April 22 so we are now proud grandparents. Our daughter Paige was married a year ago and lives in New York and just told us she and her husband are moving back to Madison and we couldn't be more thrilled. Wish I could join you, but the rigors of age are creeping up. I am having a knee replacement so won’t be able to attend. I hope you all have a great time. I haven’t retired yet because quite frankly I am afraid to. Since I don’t have a significant other, I’m not sure what I would do with myself all day. Everyone said that I will be pleasantly surprised. We shall see. 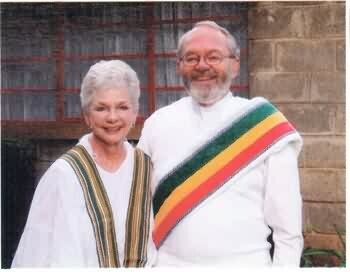 When my husband retired in 2000, we went back to Ethiopia. He taught Bible and I taught English from 2001 to 2006. I'm not old enough to retire, so I sub-teach and that provides $$ to teach English in Indonesia for 3 years in the summer. Roland and I have been married 45 years - still going strong. 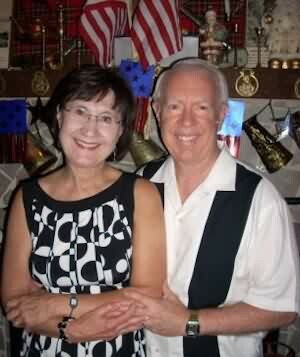 I married my high school sweetheart, Bob Merry, West High class of 1960. We have 3 children, all married and successful and 3 beautiful granddaughters ages 10-23. We have the best of both worlds. 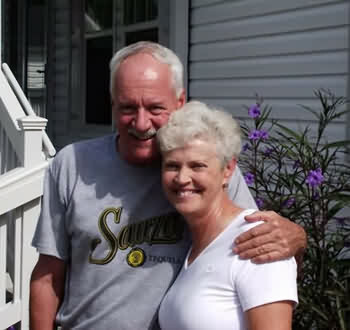 We have a home in The Villages, FL where we are from Oct. thru April and a home in Oregon, WI for May thru Sept. We love retirement and enjoy lots of golf, pickleball, cards and whatever we "Old folks" do. 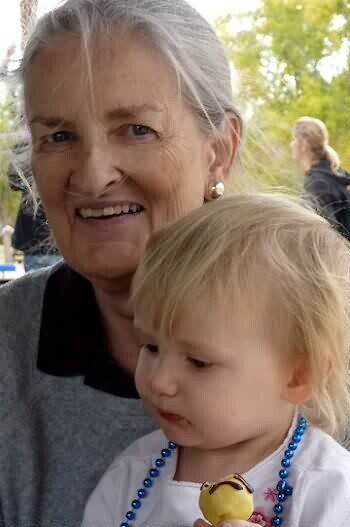 My step-mother, Ulamae Knutson Bullington, passed away in Nov. She taught English at West while we were there. I'm sure some of you had her for a teacher. Hope to be at the reunion. 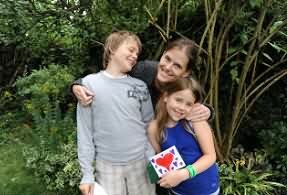 I think it has been 10 years since I posted an update here on my life although I had communications with many of you during my son’s abduction six years ago. My retirement is a joke, but I never really wanted to retire anyway. In addition to raising Erik I run a small business and web site at www.short-term-stocktrading.com I also trade my own money in the markets and in the current economic environment I have been shorting a lot of stocks. This is in my blood and I plan on doing this until I draw my last breath. Which I hope will be a long time from now. 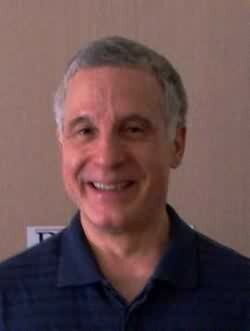 In my “spare time” I study alternative medicine and am involved with organic foods, supplementation, hormone replacement, and a lot of exercise. Erik is as nearly fanatic about this as I am and has rocked the boat a little at his school over the issue of sugar in the classrooms and lunchroom. Erik is starting the fifth grade and attends a special school for gifted kids. 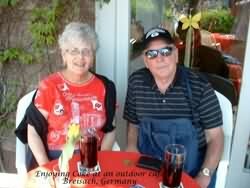 We are both retired, doing volunteer work, travelling, and enjoying our family. Our health is good and I am thankful for all our blessings. The best to all the Class of '61. Hope all is well and look forward to seeing you in August. 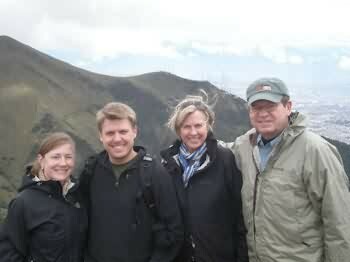 Here is a photo of Lyn and me, along with our son (Mike) and his wife (Alli), taken in Quito, Ecuador, in February. Although Lyn and I still reside in Washington, DC, where we have lived for almost 45 years, we now have a condo in Madison for use when we visit Mike and Alli, who live and work in Madison, as well as when we attend meetings at the UW-Madison. It is such fun to be back in Madison. 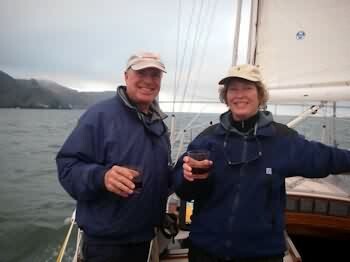 Lyn and I are both retired now and spend much of our time reading and pursuing various outside interests, including hiking, biking, cross country skiing, sea kayaking, tennis and travel. In the words of John Muir, "one must labor for beauty as for bread," and we are enjoying our time in retirement pursuing the former. Thanks to you and Karen I am reminded once again of the upcoming reunion! This time I'll respond. 1. I cannot come: I will be hiking in Colorado when it occurs. Too bad for me, as I am sure all of you will have a great time. 50 years, huh! Well, I graduated with you instead of 'my' class because I had enough credits and was sick of high school...wait, you don't remember being sick of high school? Anyway, off to college, not my first choice, but parents demanded it. Time passed, I stayed on, and eventually got a doctorate in Human Biology. Some years of teaching and consulting, and then back to school, this time Chinese medical school, from which I emerged an acupuncturist. For some years I treated patients but now devote myself to acupuncture research and writing. Hobbies: gardening, hiking, photos, miniatures, cooking (and eating). Home: Bethesda MD. I think of myself as a Wisconsinite still, and get back periodically to see friends and family. Get in touch if you are out this way--I love to see old friends! Married to Tom Wittmayer for 18 yrs. I am still at my home in Verona after 43 years. I am really loving retirement. It gives me the opportunity to volunteer in my granddaughter's kindergarten class ...seems she went to school and I followed her! 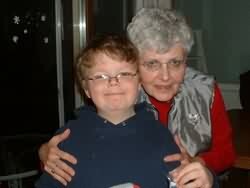 I have 19 kids who call me "Grandma Sandy" and seem to love me unconditionally!! 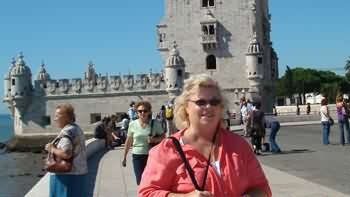 I am still a travel agent with a home office and get to travel a lot. 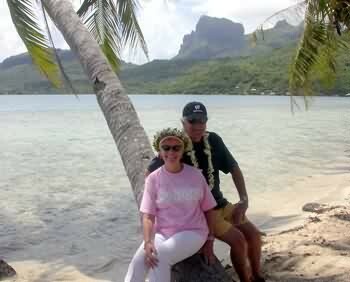 It is still my passion and our last trip was on the Paul Gauguin Cruise ship to Tahiti and her islands. I think it was the best trip that Tom and I have ever taken together. 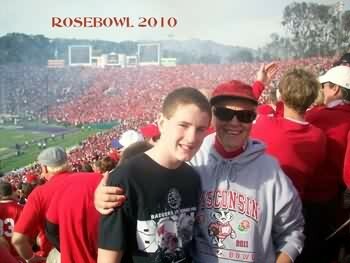 We are still BIG Badger fans and the best part about the Rose Bowl was taking my grandson, Kollyn! I am so excited for this reunion and will have some friends staying here. It will be like a "big slumber party"!! Who ever thought we would ever be so old? With Age comes Wisdom! And I thank God I am still here and planning for the 55th after this one!!!!!!! By way of a short update on my life. At age 60 I changed careers and went back to my roots in Madison where I grew up with a father in real estate. Being a full time Realtor in Northern Virginia is a challenge. Learning the strict laws that are set forth for this profession and caring deeply for the people and fulfilling their needs has been right up my alley. I will attach a recent photo for the website too. 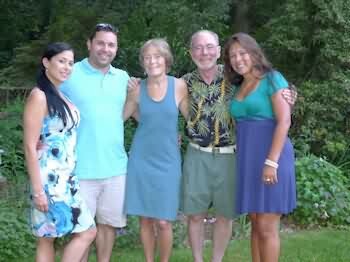 My son Kevin Marretta, wife Dee and children Kyle 4 and Kaitlyn 1 live in Naples, Florida in a lovely new home. Great place for Nana Kari to visit. Son Keith Marretta was traveling on a bicycle alone for 8 months in SE Asia and learned to appreciate the variety and life styles of people from other cultures. He is an extreme sports enthusiast and now is residing in SW Virginia. Tom, a retired FBI agent, is currently a licensed Private Eye. Sue, a retired teacher, continues to sub. 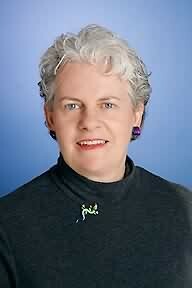 She also serves on the Gateway Technical College Board of Trustees. 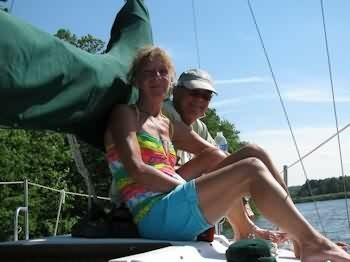 The Deans enjoy spending time on Browns Lake, traveling, and spending time with their three children and seven grandchildren ranging in age from less than one year to 20years old. We often are so busy we don't know how we had time to work full time. Thoughts, etc. 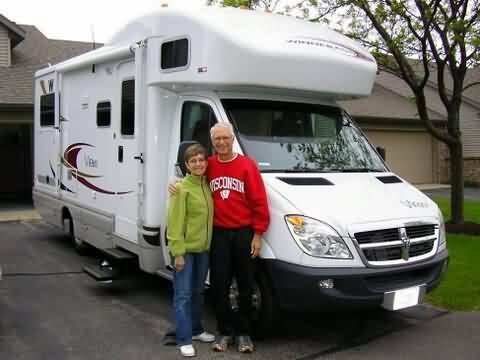 : Retired and touring America on and off in our cozy motor home, visiting family and friends along the way. Finally visiting many national parks we'd always longed to see. When home, we cherish watching sunrises over Lake Michigan from our living and dining rooms, hiking and biking lakeside trails and x-c skiing area trails. I'm retired for 6 years. Keeping busy with gardening and yard work, etc. After almost twenty-four years at Woods Hole Oceanographic Institution, first as Acquisitions Librarian and then as Systems Librarian, I retired on March 31, 2010. My husband Terry retired the same day after thirty years at WHOI as the Diving Safety Officer. It was a great career for both of us, but retirement is even more fun! In the past year, we’ve enjoyed traveling and especially the ability to be gone more than a week at a time and not having to ask permission. Last fall we did our first “geezer cruise” – a two-week small ship adventure on the Hudson River, Erie Canal and St. Lawrence Seaway. We just got back from our second one (the company is Blount Small Ship Adventures) up the Intracoastal Waterway from Jacksonville, Fla., to Warren, R.I. Last December brought a week diving on Little Cayman and we plan to go back this year. Especially fun was ten days in Orlando hitting the non-Disney theme parks. Big adventure for this fall will be three weeks in England and we may try an Elder Hostel (now Road Scholar) adventure in Salem, Mass., just to try it out. Meanwhile at home, I’m volunteering one day a week in our local hospital’s medical library and we both continue as certified EMTs with teaching CPR in the Falmouth Fire Rescue community program and serving as medical volunteers for various road races in town. Unfortunately, I will be unable to attend this summer’s reunion because it falls on the weekend of the Falmouth Road Race for which I have a 20-year long obligation as a medical volunteer. So – think of me while you’re celebrating on the 14th – I’ll be picking up sweaty bodies and delivering them to the med tent for treatment of heat stroke. Vancouver has been a great home since 1969-- we have a gorgeous co-op apartment right on English Bay, and we also have an oceanside place on nearby Pender Island. I have now been married over twenty blissful years to Santa Aloi, a choreographer and dancer and now retired dance professor at SFU, and a woman of both great heart and mind. Josh, my elder son, is now 42 and living in Brooklyn Heights with his charming Taiwanese wife and two fantastic daughters, Sara, 10 and Becky 5. Josh works for Bloomberg News--he was stationed in Asia for fifteen years. My younger son, Eli, 37, is a lawyer in the public sector, living in Toronto, with Liz, a media relations type and two sons, Sam 3, and Isaac, who is 1. Retired three years ago. I have just written a sort of memoir/methodology book built around six essays I wrote in the past thirty years, that LSU Press will publish in November, called "Views from the Dark Side of History," that tries to sort out the connections between experience and writing history. The book includes quite a lot on the Madison of our youth, including a bit on West High. Out last year from Yale University Press: "In the Name of God and Country: Reconsidering Terrorism in American History." Dave Slauson and Anne Fleming met at West, married in 1964, and recently celebrated their 47th wedding anniversary. Anne graduated from UW (B.A., English) but Dave did not. He finished his B.S. 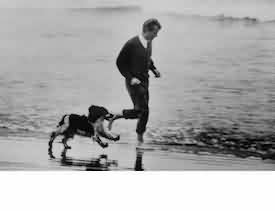 degree at the U. of California and then went into veterinary medicine there, receiving his D.V.M.in 1969 and a Ph.D. in pathology in 1973. After a post-doc at Scripps Institute in La Jolla, CA, Dave and Anne moved to Albuquerque where Dave worked at the Lovelace Medical Research Foundation. They then moved to Ithaca, NY where Dave was Professor of Pathology at Cornell University. 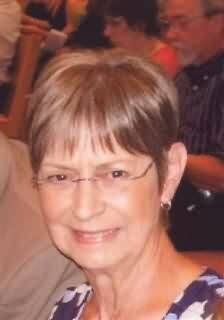 Anne completed her Master's degree in education there at SUNY Cortland, and taught 5th grade for many years. After 16 years at Cornell, Dave accepted a job as Pathology Chair at the University of Tennessee in Knoxville. While we were there, Anne earned her Ph.D. degree in education and taught student teachers as well as education classes at UT. We retired early and moved to Montana's Bitterroot Valley where we had a small ranch and raised horses. It was grand, but Dave's back eventually gave up, so we sold the ranch and moved to N. of Spokane, WA to be closer to our grandkids who live in Kelowna, BC. Our oldest son Todd died in 1997. Younger son Kurt lives in BC and is the father of our 2 wonderful grandkids, Maya and Owen. Except for some aches and pains, especially Dave's back, we are healthy, doing well, enjoying retirement, and still cheer for the Badgers and the Packers when they are on TV. Dave is having another spine surgery August 3rd so we unfortunately won't be at the 50th reunion. Best wishes to all! Good luck with this reunion, Karen. After wonderfully wasting several years as a motorcycle racer and mechanic, I finally married, settled down, and graduated with honors from the University of Wisconsin in History. The source of my new-found seriousness was Diane Mohn, my wife and partner for 35 years until her premature death in 2001. After graduation, she and I went from Madison to Ithaca and a History PhD from Cornell (American Labor) and thence 40 years in the academy. Somewhere in those years we found time to raise three boys who are now spread from Bend, Oregon to Detroit. On the academic side, my path led from the University of Alaska to tenure at Arizona State University, the University of Wisconsin, and deanships at Ohio State, the University of Michigan, and PennState. For the last 15 years, I have served as an academic vice president at several private colleges until my retirement (for a single boring year) in 2009. I returned to work in 2010 with the Registry of College and University Presidents as one of their cadre of interim deans and vice presidents. I am currently serving as the Interim Dean of Arts and Sciences at Alvernia University in Reading, PA.
More importantly, after having been taught by Diane that marriage is my natural state, I remarried five years after her death. My new source of inspiration is Mary Louise Pusch, a college Library Director from Nebraska by way of Minnesota who bore a striking resemblance to the young (and cute) Mother Jones of the 1890s. How could a labor historian resist? We live in Naperville, IL and enjoy traveling. I volunteer to help a friend raise money for Parkinson’s Disease (here is a link) and enjoy our involvement with many cultural organizations: In Chicago – The Field Museum, Lincoln Park Zoo, Shedd Aquarium, Brookfield Zoo, Remy Bumppo Theatre, TimeLine Theatre, Teatro Vista Theatre, Chicago Council on Global Affairs; Also: National Geographic, Bat Conservation International. In 2007 my wife, Barb, and I moved permanently to the log house that we built on Middle Eau Claire Lake north of Hayward, WI. We thoroughly enjoy living in the northwoods of WI - more time to hunt & fish. 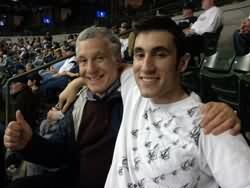 We sold our house in Arena to our son, Eric and his wife Kari who both work in Madison. Eric is at Walgreens on Mineral Point Rd and Kari is the Financial Aid Director at Edgewood College. They have two really cute kids - Isabel (4 1/2) and Benson (6 mo.). I still like to ice skate but since the conditions on our lake aren't always great for that I started cross country skiing last winter. I also keep busy with church activities, and have built some muzzle loading shotguns and a couple of birchbark canoes. A few years ago our daughter, Kristin and I took one of the canoes on a great trip to the Boundary Waters. 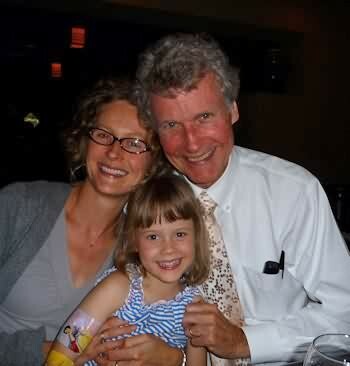 Our daughter, Kristin, lives with her husband, Ken, and our other cute grandchild, Torsten (3 1/2), in East Falmouth, MA. Kristin is a Biological Oceanographer at the Marine Biological Laboratory in Woods Hole. Ken is the captain of the "Tioga" a research vessel at Woods Hole Oceanographic Institution. We have truly been blessed. I am looking forward to seeing many of you at the Reunion. Shortly after I received my Master’s Degree in English at UW Madison, I taught high school English for a few years while my husband Tom attended Law School in Madison. After living and working in Chicago for 4 years, Tom and I moved to the Milwaukee area where Tom worked first as in-house counsel at Rexnord until he and eight other Rexnord associates purchased one of the divisions of Rexnord, which became Rexworks. Tom and I raised two wonderful children. My daughter Beth and her husband live just a half mile away, but unfortunately my son Jason and his fiancée live in Sacramento. Jason and Stephanie had my first grandchild just one month ago and I can hardly wait to visit them in two weeks. I’ve included 2 pictures of Tom and me, one taken shortly after we were married (who are those 2 children?) and the second one taken a few years before my husband died in 1998. 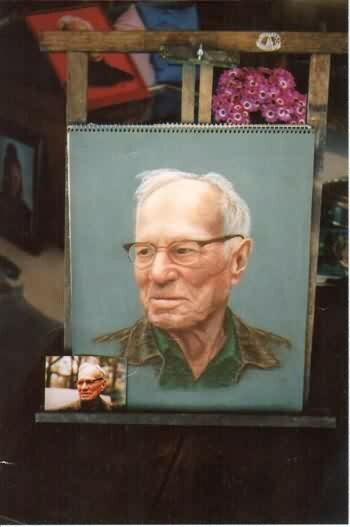 I took a number of portraiture classes several years ago and for many years, although not recently, I painted pastel portraits. I’ve included a photo of one of my pastels. Now, instead of painting portraits, I’ve become a very active docent at the Milwaukee Art Museum where I create and give tours to visitors of all ages. I’m also in charge of the art and poetry workshops. Let me know if some of you would like a private tour of the museum the next time you are in Milwaukee and I’ll be happy to give you one. In addition to loving art, I enjoy playing duplicate bridge and I’m crazy about the Packers and the Brewers. I’m looking forward to seeing my old friends at the reunion. This will be my first reunion, so in my mind, all of you still look 18. 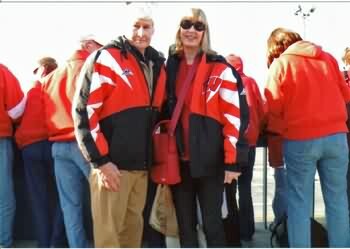 Dave and Marge (Heibel '63) are now Florida residents and spend 6 months in the south and 6 months in Wisconsin. 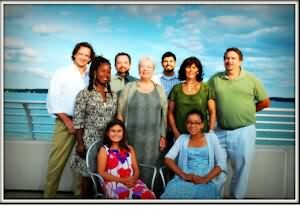 We have four children and ten grandchildren: six are in the Milwaukee area and four are in the Atlanta area. 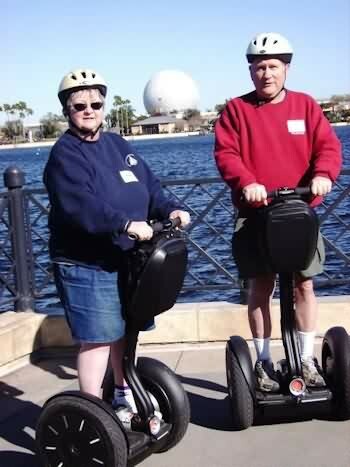 Marge and I enjoy spending our summer on Big Cedar Lake in West Bend, watching little league and taking six of our grandchildren to junior golf. Our life has been wonderful. 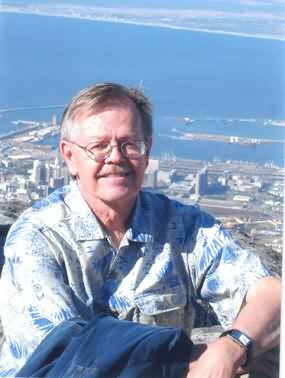 I spent my career in Pharmacy after graduating from UW in 1966 and retired in 2000. 50 years? Funny, I don't feel that old! I think my life has probably changed more in the last ten years than it did at any other time since the years between graduation and our very first reunion. 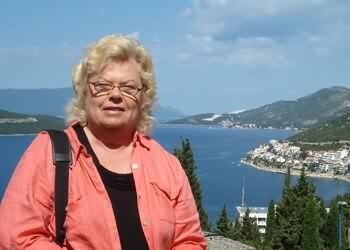 In 2005 my husband of 35 years and I separated and I entered the field of travel nursing. I traveled for 2 1/2 years, working in critical care and step-down units in hospitals in Ohio, Virginia, Maryland, North Carolina, and Tennessee. It was a very exciting time, full of learning and new experiences, but after awhile, and especially after my divorce, I got a little tired of the rootless feeling. Eventually I found what I thought would be a permanent job in Richmond, VA, and settled down there quite happily and, I thought, for keeps. However, in my travels I met in person a wonderful man who I'd previously become acquainted with online. Friendship led to courtship, and last year I moved up here to the beautiful Shenandoah Valley of Virginia. I had planned on working for awhile longer, but nursing jobs here are not as plentiful as they were in Richmond, particularly since I no longer want to work night shift. So I find myself sort of involuntarily retired, but I'm enjoying it immensely. My partner Jack is a computer systems engineer who works from home. We have 4 1/2 acres here with numerous gardens which keep us busy. I also make wire and metal jewelry, much of it with stones I tumble myself. Recently I was invited to my first regional show in Kingsport, TN. I have 3 grown children and 3 grandsons. 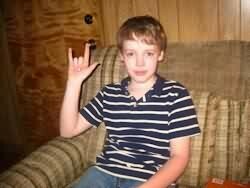 My older son Sam is a high-functioning autistic who lives on his own in Rockwood, TN. Second son Adam is a career member of the Army National Guard (his civilian job is with them also) and has served two tours in Iraq. 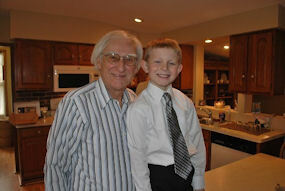 He is married to Gretchen and is the father of my oldest grandson, Isaak, who is 11. Daughter Betsy imitated her mom by having her kids first and and then going back to school. She is majoring in elementary education. Her boys are Jonathan (aka Boogie), 8, and Colin, who is 3. It's her fault I won't be able to attend the reunion--she's getting married the next weekend so I will be in Tennessee instead! I wish I could be both places at once. For those of you who remember them, my dad, Edwin Hammond, who taught geography at UW-Madison, died last year at the age of 91. My mother turned 93 this past April and still lives in their home in Knoxville, TN with a full-time caregiver. Special shout outs to Heidi Pfankuchen, Julie Morig, Judy Berigan, Chris Johnson, Lois Suomi, Sue Morris, and Mike Machotka. Wish I could see y'all! After retiring from my career as a psychiatric RN at the end of 2002, I sold my home on High Rd, in Middleton WI, and moved to SE Arizona. I had the intention of building a retirement home on some of the land I own there, but then decided it was too far from Tucson. I gave up solitude and seclusion in the foothills of the beautiful Dragoon Mountains to experience urban life in Tucson, where I had spent time since living there in the late '60's and in the early '70's before returning home to live in Middleton. I used to return to Tucson every year to backpack in the Santa Catalina Mountains north of town. Now I get to hike there whenever I want. Since returning to Tucson I have been enjoying the wonderful opportunities for outdoor recreation. Otherwise I have been attending U. of Arizona football games, concerts, plays, and also volunteer at the Arizona State Museum on campus. I enjoy returning to Madison to visit friends, attend Badger football games, and relax in northern Wisconsin. Now I am looking forward to seeing old classmates at our 50TH reunion! I retired in 2009 and moved to Kenosha, WI. I bought a little house with a backyard garden. I spend of my time painting and fixing the house. I won't be able to make the reunion, but I would enjoy hearing from any of the classmates. Following the death of my husband, I remarried and now reside full time in Venice, Florida. It was challenging to leave the family home in Madison but made easier by the fact that my eldest daughter and her family now live there. My husband Ron and I celebrate high school graduation the same year and, with regrets to my classmates in Madison, I will not be attending the 50th reunion....I will be in Rome, NY attending my husband's reunion this time. My life is kept busy with volunteer work and tennis, interspersed with travel and enjoying my retirement. If you find yourself on the Gulf Coast of Florida, please give us a call. Where have the 50 years gone? I retired April 1, 2007. It was good to get “off the road” after 39 years with Allison Transmission, Div. of GM, Sales and Service, covering WA, OR, AK, UT, NV. After retirement, we soon looked for a home out of the city and found 5 acres with a new ranch house between Bremerton and Seabeck WA. Since then we added a 3 bay unattached garage, and other features that have kept us busy. It is really quiet out there and we enjoy the mountain views and the country life with the deer, eagles and wildlife. 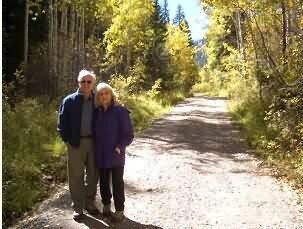 My wife Gloria (46 short years) and I still enjoy Washington State and the entire West. Our son Jeremy and family- with a grandson 7 and granddaughter 20- live in Lake Forest Park, just north of Seattle about 2 hours from us by either ferry or road. Our daughter Leah and family- grandsons 13, 15, and 23- are in Columbia, MO. 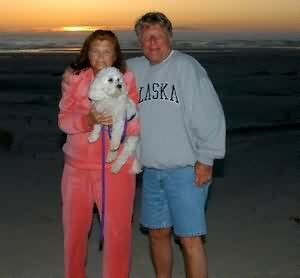 Enclosed is a picture of Gloria and Asti our Bichon, and myself, and one that includes our daughter and son; the pictures are about 2 years old when we all together on the OR coast; it is not often that we all get together. This summer, as last year, we’ll be in MO and Mazomanie with a short trip to Minocqua in June with Gloria’s family; about all of my family are gone. That trip is ill-timed to make the 50th, but Party Hearty, and we’ll be thinking of you all that weekend. We spend our winters and part of the summer in Breckenridge, CO. We downhill ski, back country ski, hike and bike when we are in Wisconsin. It's all about children and grandchildren. 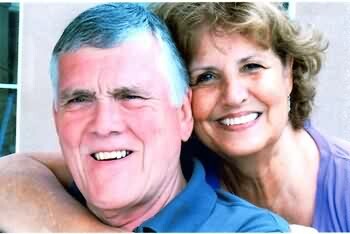 Bio - Andy and I are happily retired and living in the Minneapolis area since 2005. 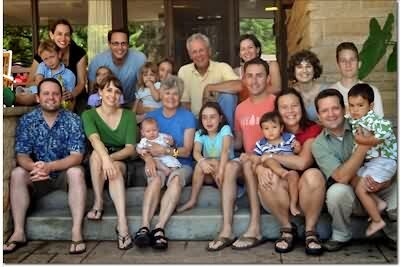 We came back to the Midwest after 20 years in San Diego to be near family - our daughter, siblings and their kids and grandkids. We take care of our 2 standard poodles, Polly and Sophie, do some traveling and household projects, and spend time with family, friends, and neighbors. I can't make it to the reunion but still think Madison is the best town I've ever seen. I want to say a special hello to my 2 best pals from Randall, Karen and Marcia, and to my West friends, Linda, Lanny, Sharon, and Joanie. I'd love to hear from classmates. I am 100% retired. Love my quilting and crocheting. I am active in Dane County RSVP. My grandson Shane is currently serving his 2nd tour in Afganistan. Prayers are welcome as he has survived 3 IED attacks on his unit this tour. We (George and I) are still enjoying retirement. Manage to keep busy with playing cards, gambling, and playing with "Grand Boys". 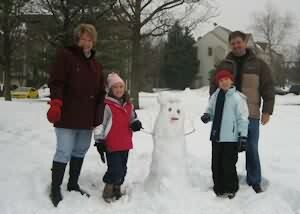 The photo below is our Christmas card from 2010. 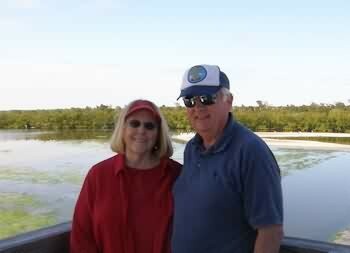 George and I love living back in Madison and enjoy our home, pond, gardening and involvement in Madison organizations. 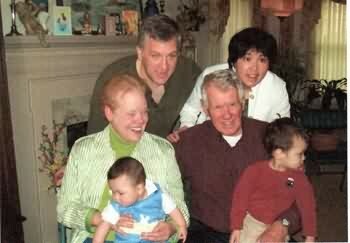 Daughter Joan is an attorney in D.C. She, her husband and our grandsons, now 4 & 7, live in Maryland. Son Scott owns a small business in St. Louis. 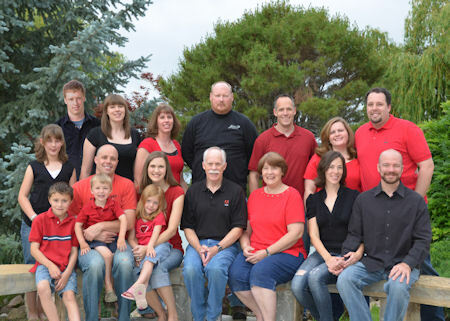 We have had many special times with McDowell and Beestman relatives in the Madison area. My mother, Ardith, almost 93, enjoys an active life at Oakwood Village, 5 minutes from our home. In recent years, enjoyed International Travel to Paris, Japan, Croatia & Adriatic Seacoast, Cruise on Baltic Sea with stops in St. Petersburg, Denmark, Germany, Estonia, Russia, Finland, & Sweden. We plan trip to China & Tibet this October. Three or four US trips each year for pleasure and/or business. Concerts on the Square, outdoor picnics, Farmer’s Market on the Square, American Players Theatre, UW football, Forward Theater Co, Madison Symphony, etc. 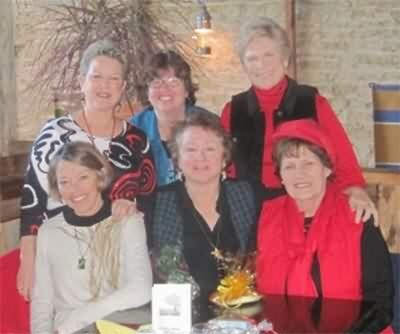 I enjoy being active in Downtown Rotary, Tempo Madison - network of women leaders, Madison Area Business Consultants and serving on the Board of the Oakwood Foundation. I look forward to re-connecting with Class of ’61 classmates! Can't attend the Reunion. But here's an updated pic. Just published by Deep River Books in 2011, The Forgotten Awakening is my book about the first contact between white people and American Indians in the Pacific Northwest. Life would be complete if I could just see the famous "SHOPS" video ONE MORE TIME!! Looking forward to renewing long lost friendships and perhaps starting some new ones in August. Have been happily married to Arlene Blanche Mowry since 1966. We met our JR year at the UW and the rest as they say is history. Our daughter Dana was born in 1975. She will be married this Sept to a great young man from Holland. Should be a fun wedding with about 40 family and friends of the groom coming over from Holland. 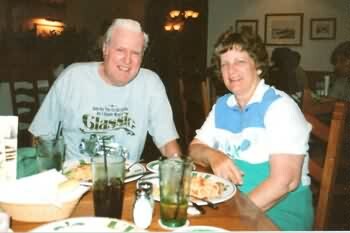 Arlene and I had happy and successful careers at Hallmark Cards until taking early retirement in the mid 90's. Currently doing some marketing consulting work when opportunities arise. We love to travel, including many trips to visit our daughter who has worked at the Waldorf-Astoria since graduating from Michigan State...the turncoat!! I enjoy golf and am still working to break 80 one of these days!! Would anyone be interested in playing golf the Saturday am of the reunion? I would love to play the University Ridge Golf course. We recently got a Golden Retriever puppy and love training and playing with her. I enjoy taking her for long walks... a great way to get my exercise! My twin brother Bill passed away about 8 years ago. He definitely would want us to party hardy!! Would love to hear from any classmates. See you all in August!!! Retired teacher after 42 years as Chemistry Teacher at Verona High School- Still coaching Cross Country and will be starting my 47th year next fall. Coached track as well for 45 years, 39 years as the head coach and the last 6 as assistant. 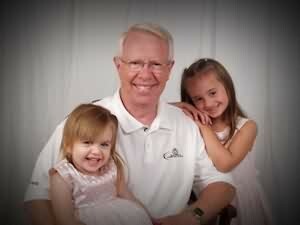 Am enjoying retirement and especially hearing the word Grandpa from my four grand daughters. Caroline 11, Lauren 9, Lilly 3, and Charlotte 1. I wish I would have been as patient with my kids as I am with my grand kids. Makes one think of trying that parenting gig over again, maybe not. Proud to be a West grad. Back when we were in school you had to earn your grades. We had no extra credit, no taking tests over to improve. Our parent didn't chew out the teachers and blame them for our mistakes, they just chewed us out and we improved or else. There were some good things about the good old days for sure. I would like to thank all the friends I had at West and otherwise for being part of my life. For those of you that I didn't know but passed in the halls I hope you have all had a great life full of challenges and rewards. Hopefully we have all learned life's lessons from our mistakes and have learned to treat everyone with a kind heart and that usually trumps all other suites for happiness. See you at the reunion. - Go Regents Go- Your power shows- strive on a little bit more of it, lots of it, Regents lets GO. The past 50 years have kept me busy and I haven't slowed down yet. I still work full time and working for the school district gives me summers off to enjoy travelling or to do absolutely nothing if I feel like it. My biggest accomplishment has been raising my grandaughter who had a rough start in life being born too soon and too small. She overcame the odds to grow into a beautiful young woman that graduated from West in June on the 50th anniversary of my graduation. I was so proud to see her walk across the stage at the Kohl Center, not quite like the Field House for our class, but a class that was just as big as ours. We will getting back from a long road trip along old route 66 just in time for our celebration. Can't wait to see everyone. Wow...50 years have passed....what a great ride!! Looking forward to seeing everyone. I'm sure we all look the same as we did in high school!! I will miss the ones that won't be there. Updated bio. New since the 45th reunion bio are my two grandsons. Otherwise life has continued along the path described in earlier bios. I am thinking of retiring in a year. Two photos are attached. 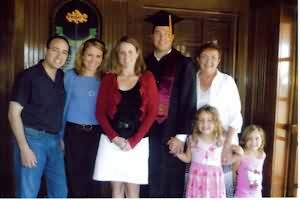 One shows my son Damon, his family, my wife and me. 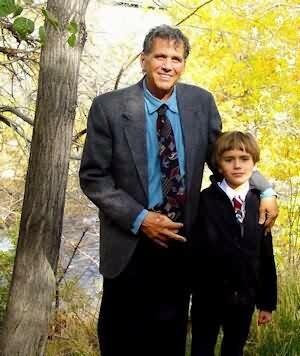 The other shows my son Dustin and me. Having fun with family and friends in California and Pittsburgh. We're doing some sailing and fishing at a wonderful lake near Pittsburgh, and visiting nieces, nephews, children and grandchildren in Pgh and Philly. Can't wait to see all of the smiling faces in Madison. Thank you Ed for all your work on the Reunion and website. Ron and Susan (Wehrle) Quisling. 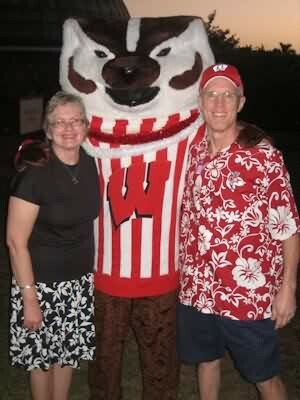 Although we both were in the same High School class we didn’t really date until I went to Med School at Wisconsin. We married half way through. We always expected to settle in Madison. I even had a job arranged at Madison General Hospital following my residency and fellowship training. However, I got drafted in 1969, spent my training years in the Army reserves. Vietnam was ending when I finished and I thought I would not be needed. But , the Army went volunteer and my name was on some list and I was sent to Ft. Benning, Georgia rather than Madison. My job disappeared and we had to reconnoiter when my service time was over. I had the good fortune of finding a position at the Univ. of Florida Medical School in 1976 and the rest has been history. 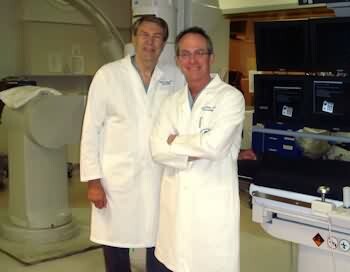 I still work full time running the Neuroradiology division (see picture 1). We have loved Gainesville Florida; it is similar in size to Madison in the 50’s and 60’s . The University of Florida has been a wonderful institution with which to be connected. Gator mania runs rampant; always has and always will. The university generates much of the energy of the town, much like UW did for Madison when we were growing up. 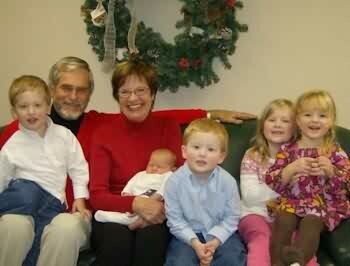 We raised a son and a daughter here, and now have 6 grandsons (picture 2). Hence, thankfully, the whole cycle is repeating itself. We both have an intrinsic fondness for Madison. Most of my family no longer resides there and have dispersed throughout the country. I still think of all the images of growing up in Madison: the Willows Beach on Lake Mendota, Vilas Park, the Olympic training ski jump in Middleton (I did that for about 9 years). I think of some of my classmates who were with me from Randall elementary school (Mary Doyle, Dorothy Rollefson, David Walsh, David Marsh, Ned Dean and Hiliary Harrington). I can still remember Hilary Harrington reading us her stories about two central characters (Hiliary and Ned) in third grade; they were really good. I was at Madison West for middle and high school. I still remember the collision of the West and Cherokee students coming together for high school; I remember feeling like my personal space had been invaded, but I quickly got over it. We were all very fortunate to have been in Madison at that time. Life was simpler and predictable; it was far less complex than today. We could be goofy adolescents in peace. 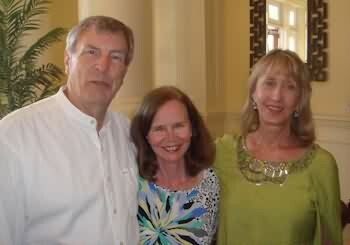 Our Quisling family has just had a reunion in Sandestin, Florida. 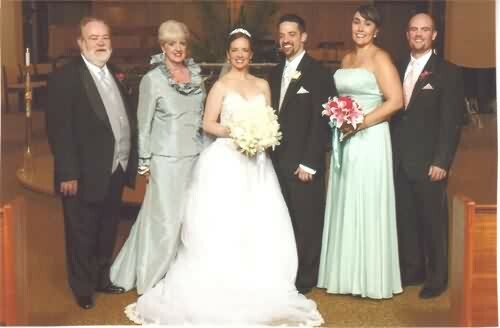 Ann Hobbins married my cousin Rolf. Therefore, we took a picture of the 3 of us to be included in the Web site, that Ed Grob has so graciously provided (that is picture 3). I hope other classmates take the time to send photographs and Bios to the web site. I have thoroughly enjoyed it, although I don’t recognize anyone and I’m sure you won’t recognize us; that is the inevitability of the passage of time. We trust that you will have a wonderful reunion. I no longer fly and its too long a drive to attend. But, know full well we will search the class of ’61 website after the event. Please take a lot of pictures (with labels). God Bless you all. Ron & Susan Quisling. I look forward to seeing all of you in August for our so" reunion. To bring you up to date on my life since the last reunion, I am still in a very active "retirement". I work in both my antique business at Odana Antique Mall and with our family business, Westgard QC, selling software, books and training materials to medical and hospital laboratories. 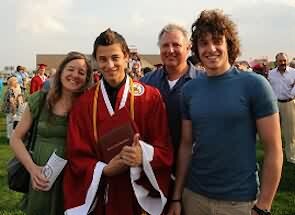 Our adult children (both West High grads) have given us four terrific grandchildren. Our son Sten works in the WQC business and lives in New Haven CT where his wife works at Yale. 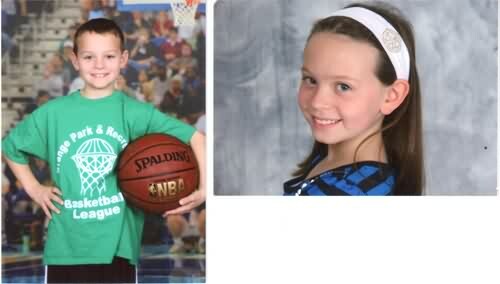 Their children, Maren, age 10 and Henry, age 8, are active in theater and sports. Our daughter, Kris, an attorney, works as Associate General Counsel for Invista (a subsidiary of Koch industries). 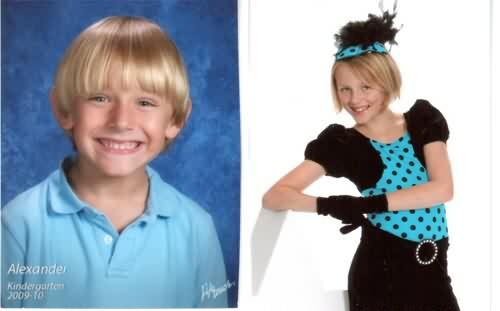 She and her husband, an attorney, live in Wichita KS and have a daughter, Linnea, age 9, and a son Alex, age 7. Linnea is the family dancer and Alex loves all sports. Westgard QC has continued to take us all over the world as Jim consults, gives seminars and speaks on Lab Quality. Most recent trips have been to Mexico, Sweden, Finland, the Netherlands, Antwerp, and Berlin. This fall we go to the Dominican Republic. 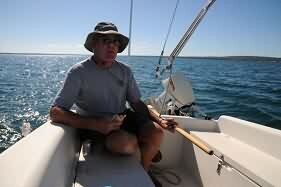 Jim became an emeritus professor at UW-Madison about 5 years ago but has continued to teach in the CLS program. Jim and I have been married for 45 years now. He is my Norwegian farmer was raised in North Dakota. Recently that heritage became very exciting when we were notified that an exploration company has discovered oil on his family's land! We have seen photos of the oil derrick and well but we plan to head out to that area this fall to see it for ourselves. I have been retired since 2002. I have filled my time recently with home remodeling projects, reading, doctors appointments, and small trips. We went west by train and tour bus to California and got some things off the bucket list. Ken is still working part time and that gives me time for lunches with friends. Both parents have passed away, so I am an orphan - it is hard being the oldest in the family and not that wise. I take pride that my children are employed, have nice homes, and everyone is a good citizen. The grandkids are 9, 13, and 16 and we love them from a distance. Have worked at Pohjola Bank, Helsinki Finland (Finland's biggest bank and ranked 33 safest bank in the world)....have worked here for the past five years. Proud to say that I will be the first in the bank's 109 year history to be offered a work contract beyond 68 years of age. That said, I will maintain my position here as Senior Adviser, Capital Markets Division. My wife, Minna turns 50 this year and she maintains the home front as we continue to live in the Finnish countryside, basically a farm surrounded by grazing land and forest. Still have a multitude of animals to take care of....12 dogs, 7 cats, 3 horses and a variety of farm animals. My wife's day is full. With one daughter in CA and another in FL, my youngest daughter Celina (21) attends Helsinki Business School. I am very disappointed not to be able to join everybody in Madison, the city that I have not seen for the past 26 years, but I have to be in Positano Italy that week for a European bond conference. Best to you and to everyone from the Madison West Class of 1961. Can it really be 50 years? Wow! I have a bit of an update! Right after 9/11 EMC, where I was a senior software engineer, closed the Colorado Springs office, and there were no jobs available. I decided to go back to school and become a nurse! Graduated with a 4.0 even at our age in 2003 and worked a few years in a clinical setting and then became a courseware developer designing courses for other nurses. I retired April 30 of last year and retired to paradise – oh, I’m sorry, I retired to Cabo, where I am happily enjoying sun and surf virtually 365 days a year. Best to all at the reunion. 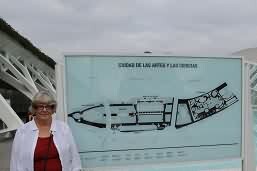 I will be travelling in July but will be back in Baja California by the weekend of the reunion. Colorado Springs cell phone is still active and rings right here in Mexico. Since the 40th reunion I've retired from teaching in Colorado, and I've relocated to the Washington coast in Port Townsend with my wife, Lynn. We have been active in our church and with its music. I've also formed a folk singing group called Shady Grove; we perform music primarily from the 50's and 60's. There are lots of people our age in our area, and we've been well received. Our two kids, Vale and Leenya, are active in music and acting, living in and near the Big Apple. Leenya has performed in several Broadway musicals, and she is now performing in War Horse on Broadway. Vale is an opera tenor, performing throughout the U.S. and Canada. 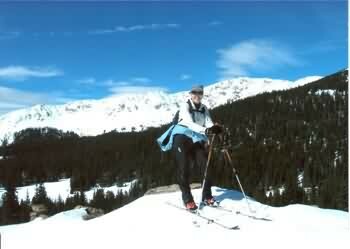 Our recreational pursuits include bike touring, kayak camping, and ski touring. In early August I will be biking in the SAGBRAW, a one week, 340 mile ride from Marinette WI to Kewaskum. For the most part Washington has filled our needs, but the last winter and spring have been pretty cool and gloomy. We're ready for summer! 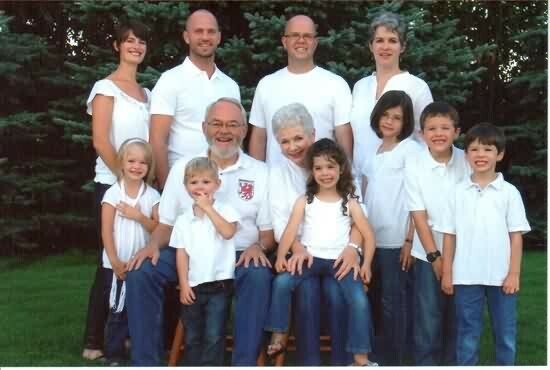 Still just 3 kids, 6 Grandkids. Picture on the website is of my youngest son, Jon, with the six grandkids in one of our many restored military jeeps. See them all at the Monona Memorial Day Parade. Al and I have been retired since 2007. We've enjoyed having the time to travel, to spend time at the cabin we have in the Berkshires, to have more time for visiting our children/grandchildren and to participate in the music and outdoor activities we love. It's hard to believe that we're old enough to be having a 50th reunion! After 20 wonderful years heading up the Oakwood Village Foundation, I retired in 2009. At first it was an adjustment, but I couldn’t be happier now. I have lots of time to enjoy and “be there” for our children, to spend quality time with our grandchildren, to support aging parents, to develop new friendships and deepen relationships with old friends, to pursue creative activities, to volunteer, and most importantly, to spend time in the north woods with my wonderful husband of 45 years – how could life be any better?? Enjoying retirement in Montana -- fly-fishing, church community, our local brewery, small orchard, great friends. Sons Frank and Robert Schiro, both of whom work in the law enforcement field, State of Wisconsin and Dane County. Eight grandchildren -- Frank has Sophia, 19, Dante, 17, Carlito, 13, and twins Franky and Sal, 12. 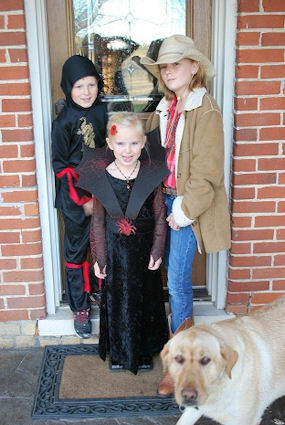 Robert has Nina, 10, Francesca, 8, and Sammie, 6. The boys are great wrestlers while the girls participate in swim team. They are the joy of my life. I bought a stone in memory of all the West High Veterans who served in peace and war time. It is nice to have Ralph and Libby and also Hickman back in the Mad City. God bless to all West High fellow alumni. 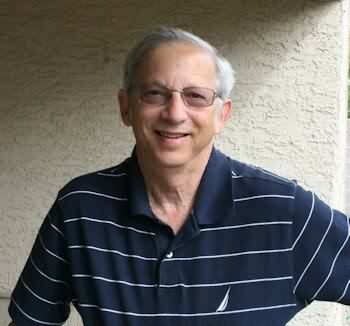 Retired in 2006 after 40 years with Graber/Springs Window Faashions in Global Sourcing. Currently am a consultant with 2 of my career long standing Asian contacts on a part-time basis. Enjoying family, friends, travel, and lake life. Mostly retired after 40 years of engineering 100's of buildings state wide, including the original Packer practice building. Now ready to travel U. S. in our new trailer. It has been 10 years since my last updated Bio and much has happened in our lives. 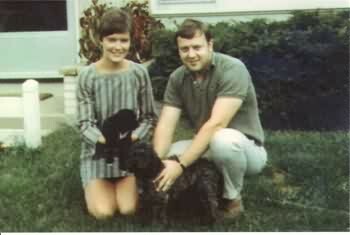 Patti and I are still married and will celebrate our 45th anniversary on August 16th. Our oldest son Jeff, 42, is still unmarried and still enjoying his bachelor lifestyle which now includes a second home in Telluride where he wishes he could spend more time with his friends there and his two black English Labs. Our youngest son Greg, 39, and Marcie were married in September of 2002 and now have 3 daughters, 12, 7 and 4. 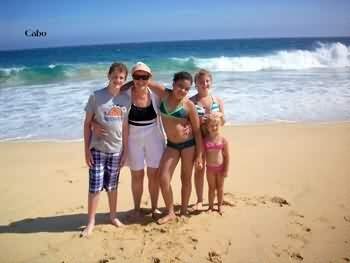 They live 5 minutes from us and we very much enjoy being grandparents to Shayna, Samantha and Jamie. Our lives are very full and blessed. After operating our health care consulting firm for 20 years and a second company, a medical coding business, in August of 2010 we merged the two businesses into a new holding company and sold a majority interest to a private equity fund. Part of that transaction was that I would work half time in 2011 as CEO, Emeritus. Jeff and Greg continue to run the business which has grown since last August as the result of making 3 additional acquisitions to create an integrated healthcare data analytics and consulting firm. I am adjusting to no longer having to work full time which allows us to travel and me to play more golf. I also have become more involved in my teaching at the UCLA School of Public Health and have become very involved as a member of the Campaign Committee for the UW School of Nursing helping to raise funds for the new Nursing School building which will break ground in May, 2012 and open for classes in the fall of 2014. This involvement has afforded me the opportunity to return to Madison on multiple occasions and to see and interact with Jeff Bartell and David Walsh who are very active in UW Governance both at the University level as well as for the UW Health System. I am very much looking forward to seeing everyone for our 50th in August and enjoying time together although it is hard to believe that it has been 50 years since we were lunching at the "Shops". We have been married for 46 years this August. 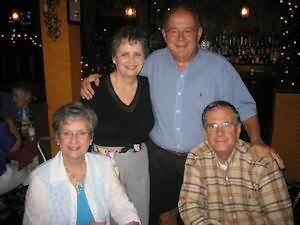 We are blessed to have our son and daughter-in-law 10 minutes away which enables us to see our grandchildren often. I have a busy and interesting life! I am a professor at Albany Medical College, practice primary care for children and adults, teach medical students and residents, do research on health-related judgment and decision making, work for single-payer health care, spend several weeks a year in France, and play tennis weekly. But I sure don’t move as fast, in any of this, as I used to!! Since Christie’s sudden death, my daughter has wanted me to move to Boston (she is an assistant professor of English at U Mass Boston). But, in spite of the lure of grandchildren, I haven’t been willing to give up clinical medicine. Maybe in a couple of years…. I visited with Betsy Paddock Halpern in Portland. OR, and see Mike Mulvihill, Fred Lerdahl, and Dorothy Rollefson here on the east coast—they are all, as my daughter would say, amazing!—and I send my greetings to everyone else. 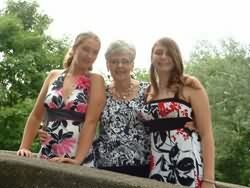 I am attaching a photo taken last summer of my daughter, my granddaughter, and me. Still working as a lawyer - still enjoy it. 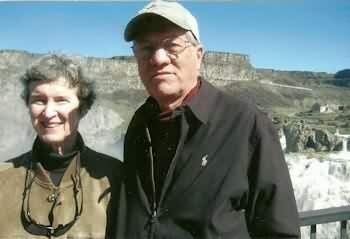 Chris and Ellen (West '62) Sterling continue to live in Northern Virginia, just outside of Washington, DC. Chris taught at George Washington University (media and public affairs, and public policy) for nearly three decades and retires at the end of calendar 2011. 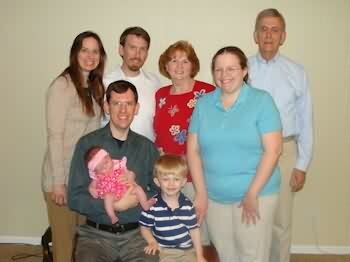 Our two daughters, and two grandchildren live within an hour so, so we'll remain in the greater Washington area. Chris authored or edited some 25 books over his career (see www.ChrisSterling.com if you really want to know more!). Ellen knits up a storm and makes silver jewelry, among other activities. We've been to all 50 states and future plans include more travel, and pursuing and publishing articles about a number of long-time avocations (history of civil aviation and passenger shipping, Winston Churchill, the development of Washington, DC, and classic [1928-41] cars--among others). We look forward to retirement as the next stage of our lives! 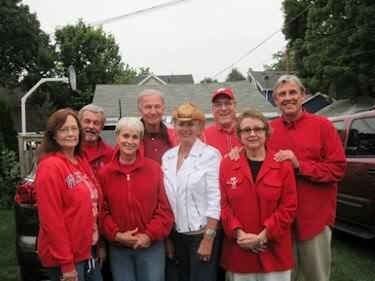 Here is a bit to go with the 50th reunion of Madison West Class of 1961. After 34 years as a photographer with The Associated Press, my wife, Raleigh, and I moved from the Pacific Northwest to Las Vegas, Nevada where I set up shop with my own business about 7 years ago. I spend my time taking photos of the shows and celebrities on the Las Vegas Strip. I also enjoy visiting the National Parks in the area. We have two married children. One lives in Seattle and the other lives in San Francisco and both are married and I have one grandson. Along with my work for clients, I have produced six books on subjects from celebrities to things like Microsoft's Bill Gates and Boeing. I am now working on a book for 2012 on Washington State and my history as a photographer. It will be with a show opening in Seattle at the Museum of Science and Industry. I have included a new photo of myself. 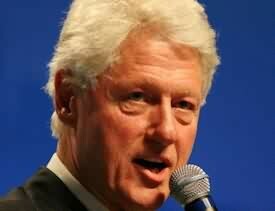 Other photos include Bobby Kennedy, Martin Luther King, and President Clinton. 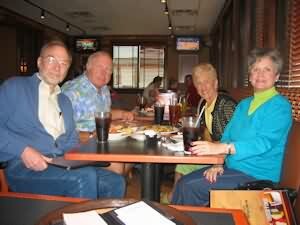 I retired from Tinker AFB OK in 2008 after 42 years (military and civilian). I have 3 grandchildren now to follow in school events. I took out my trumpet 15 years ago and joined an 18-piece "big band". We play for multiple dance clubs in the OKC area (including a monthly dance at a local Senior Citizens Center). We also play marches for Air Force and Navy change of command ceremonies and promotions, Christmas tunes in the Tinker AFB Commissary and BX in season, and an occasional Octoberfest. It's hard to believe its been 50 years since graduation. I see some drivers that appear to be 13 years old. I know we can't be as old as the calendar indicates. We are still in Boston and sold our 5-story Beacon Hill town house last year.Are planning to move to condo in August. Husband has finally retired from practice and we enjoy travelling. Boston Symphony, theater, both here and NYC, & outdoor activities. We enjoy winter less & less. I am a retired Attorney and Journalist. I still work part time cleaning up Camp Randall, the Fieldhouse, and the Kohl Center after UW athletic events. I also perform with te Italian Folk Dancers of Madison at events such as the Festa Italia and the Triangle Ethnic Fest. Update for 50th: My wife, children, and I are all well. I retired at the end of February of this year and I am enjoying the new freedom very much. The journey to now included The College of Wooster (1961 - 1963); US Army, Ft. Leonard Wood, MO, and Hanau, Germany (1963 - 1966); finishing undergraduate degree, University of Wisconsin (1966 - 1969); University of Wisconsin Computer Center (1969 - 1970); graduate school, University of Oregon (1970 - 1972); bicycle mechanic and programmer, Hanover, NH and Dartmouth College (1972); programmer, MIT (1972 - 1975); programmer and research associate, Laboratory for Computer Graphics and Spatial Analysis, Harvard University Graduate School of Design (1975 - 1988); graduate degree, Boston University (1980 - 1984); research geographer, US EPA, Corvallis, Oregon (1988 - 2011). I split my Bachelor’s work between UW and BYU, with a two-year LDS mission after the 1st year, and I graduated, like many of my classmates, with Uncle Sam breathing down my neck. During my officer candidates training I married Eunice Hawkins whom I had met and dated for a week before leaving for OCS. My last ten months in the Army I spent in Vietnam, but fortunately did not have to spend it in the jungles. I returned to BYU where Eunice was finishing her BA and earned my masters in Counseling and Guidance. For the 37 years since then I have been a school counselor, with all but one year at the elementary level. In that capacity I have been fortunate enough to have the opportunity to be a part of significant changes in the lives of children and their families. My interest in ADHD, probably because of my own hyperactivity as well as my children’s, has led me to carry the responsibility for training the 60 some counselors in our district, as well as others throughout the state, in appropriate assessment procedures, and the importance of covering the full spectrum of treatment methods when meeting with parents. We have also provided 30 parent classes on ADHD every year for six years. This year we are experimenting with helping students with ADHD, depression, anxiety, or stress do better in my school by having them exercise for a half hour before school starts. 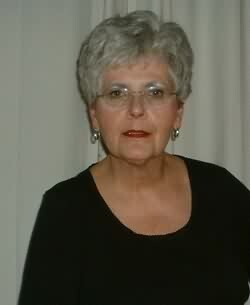 Eunice was in the airline reservation business for a number of years, and managed the official travel office for Hill Air Force Base before she retired. We both serve one night a week now at Ogden’s family history library. Melanee (40) is a graphic artist with 3 children. She and her husband, a government employee, live in Minnesota. Carlos (38) is a project manager for an international business, and his wife is an ultrasound technologist. Andre (36) is with the UT Air National Guard unit that flies electronic surveillance in Afghanistan, Africa, and Columbia. Chris (34), unfortunately, is in real estate and he, his wife, and 3 children are working at getting their feet back on solid ground. All three of the boys live between Ogden (where we live) and Salt Lake City. Natalie (29) and her husband work in the LA area, where she has a profitable business teaching Zumba, along with some ballet classes. My wife Maggie and I are still living in Grants Pass Oregon, however a new aspect to our life has finally occurred. WE ARE GRANDPARENTS!! Our son Kristopher and his lovely wife Breanne moved from Oregon to South Carolina several years ago where they had our first grandson in Feb. of 2010. Soooo..... we decided this would be a good time to retire and be able to spend time with them on and off throughout the year. It wasn't long before we realized we needed permanent accommodations in the Carolinas. We are now owners of a new town home in Charlotte NC, about 20 minutes from them, where we will spend our winters. Looking forward to the 50th and seeing old friends. Dan Stiehl, you better be there! 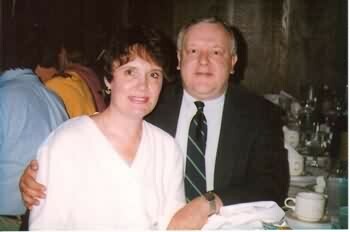 We--Bob( class of 60) and I--Judie( Judy) Wilson Ellison-will not be able to be at the reunion. Not much has changed since the last input--just older. Still love to go RVing and on small water( i.e., rivers) cruising. we've added 2 great- grands--. We are proud to have son serving as a Sgt Major in the Army and a granddaughter who has just begun her Army service. Looks like a great w/e is planned in August!!! My husband Michael and I are living our lives without much fanfare on a beautiful wildlife refuge in Leavenworth county Kansas. We're about 45 minutes from any real civilization as we know it, but it's peaceful and quiet and wonderful so we don't mind having to drive 30 minutes to the nearest restaurant We're both still working, Michael more than I, but we travel occasionally mostly to visit friends and family especially grandchildren. We have four. They are darling and precious beyond words...much cuter than yours. We spend our free time on maintenance of our bodies and our stuff and when we talk, we talk about what we are or hoping or expecting to experience in the second halves of our lives. It's the next great adventure don't you think? Children: Michael (31): Online Architect, Sigma Designs. 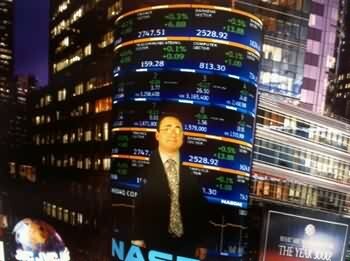 Picture is Michael on NASDAQ's board in Times Square. BS degree in chemistry from UW and PhD in organic chemistry from Penn State. Research chemist for Eastman Kodak; assoc. prof. of chemistry and head of the science co-op program for Rochester Institute of Technology; senior editor for Ullmanns Encyclopedia of Industrial Chemistry. Various positions at DuPont in Wilmington, DE: information specialist, patent liaison, technical writer/editor, web developer/programmer, internet consultant. 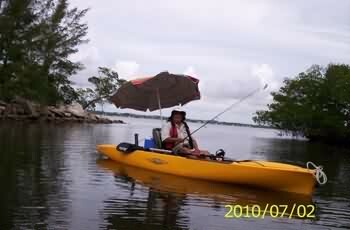 After early retirement in 2003, moved to Florida. Worked as adjunct professor of chemistry at Palm Beach CC and Broward CC. Also managed pro shops at tennis clubs and taught tennis to juniors. 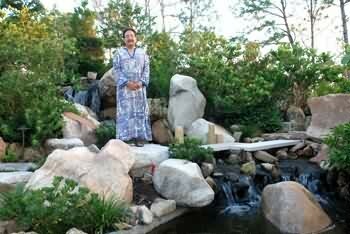 Now working full time maintaining my Japanese restorative garden and kayak fishing in my spare time.